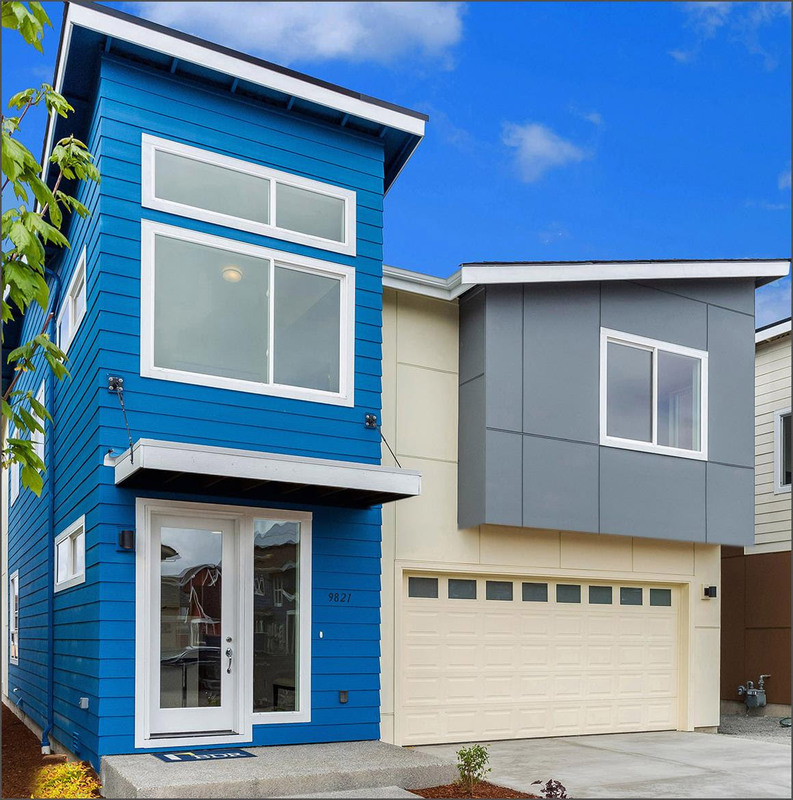 The newly completed Capriccio modern homes are situated in the heart of the charming Greenbridge masterplanned community in Southwest Seattle. The homes are located directly adjacent to neighborhood parks and community trails and they’re just around the corner from schools, a community center, a coffee shop and much more! The Capriccio homes feature unique signature covered outdoor rooms, gourmet chef’s kitchens with large islands, and BDR luxury features throughout. Don’t miss this opportunity, with 13 homes already sold and only 2 remaining! 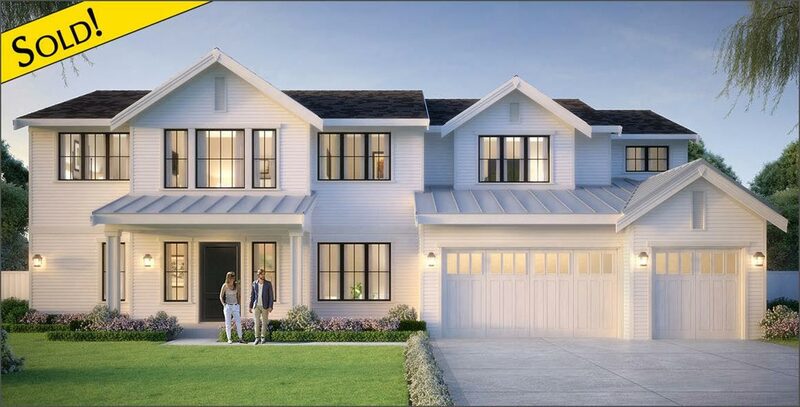 Discover attainable new construction living at Greenbridge, a charming and inviting masterplanned community located just 12 minutes from downtown Seattle and Sea-Tac airport. Come discover Seattle’s Best Kept Housing Secret! Pre-Sale reservations are available now for the Market Townhomes situated in Kirkland’s coveted West of Market neighborhood! Reserve one of 8 modern luxury townhomes situated steps from the shopping, dining, and entertainment of downtown Kirkland. The Market Townhomes will be completed in 2020. The 3 bedroom townhomes offer over 2,800 SF of luxurious living space and feature chef’s kitchens with professional grade appliances and gourmet islands. The townhomes also feature private covered outdoor rooms complete with fireplaces and attached 2-car garages. BDR Homes specializes in building townhome and single family home communities in the Eastside’s most desirable neighborhoods with a quick connection to the regions top employers. 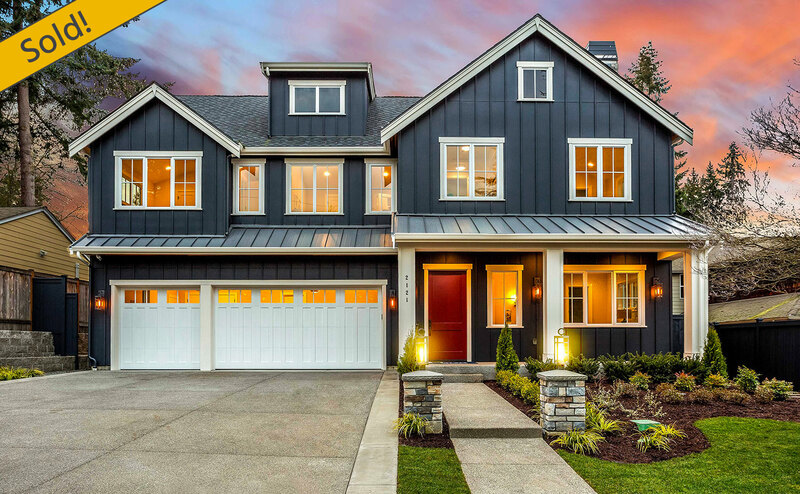 The BDR team has over 400 years of collective home building experiences and is the proud recipient of numerous awards for building excellence, including the 425 Magazine 2018 “Best Builder” award. BDR Homes LLC is a wholly owned subsidiary of BDR Holdings LLC, a diversified real estate company specializing in innovative housing projects throughout the Puget Sound region. Conveniently located in the heart of downtown Redmond, these fresh new townhomes are situated directly across the street from the top-rated Redmond Elementary School. Walk to Redmond Town Center, Marymoor Park, shopping and dining! The central location offers a quick-connection to the nearby Microsoft campus and the new Redmond Facebook campus. These 3 bedroom townhomes feature gourmet chef’s kitchens, open-concept floor plans, attached garages, and BDR luxury features throughout! BDR Homes specializes in building townhome and single family home communities in the Eastside’s most desirable neighborhoods with a quick connection to the regions top employers. The BDR team has over 400 years of collective home building experiences and is the proud recipient of numerous awards for building excellence, including the 2018 425 Magazine “Best Builder” award. Tour this newly completed luxury farmhouse situated on a quiet street in the heart of Enatai. Offering 4 bedroom suites plus a den and a flat, sunny west-facing backyard. Walk to the new award winning Enatai Elementary School. BDR signature luxury features include a covered outdoor room with heaters, a fireplace, TV, & BBQ. The chef’s kitchen features a large gourmet island with bar seating and professional grade appliances. The Grand Opening event will feature local gourmet catering by Bis On Main and complimentary valet parking will be provided for your convenience. 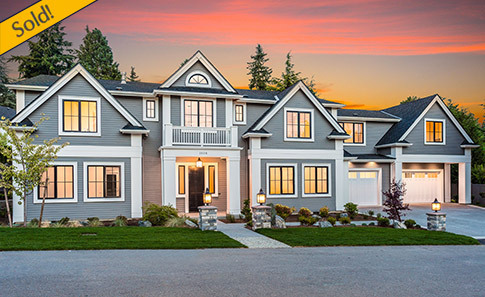 BDR Fine Homes specializes in building luxury homes in the exclusive communities of West Bellevue, Clyde Hill, Medina, Yarrow Point, and Mercer Island. Uniquely designed and featuring the latest in high-end finishes and incorporated technology, BDR Fine Homes offer the very finest in luxury living. The BDR team has over 400 years of collective home building experiences and is the proud recipient of numerous awards for building excellence, including the 2018 425 Magazine “Best Builder” award. BDR Fine Homes LLC is a wholly owned subsidiary of BDR Holdings LLC, a diversified real estate company specializing in innovative housing projects throughout the Puget Sound region. Tour this newly completed private and gated luxury home situated on a quiet street in the heart of Medina. Offering over 6,100 square feet, 5 bedroom suites plus a den, and a 4 car garage. Walk to Medina Park, Medina Elementary, the nearby Beach Park, and the Green Grocery Store. The home features a sunny and flat backyard and a signature outdoor room with heaters, a fireplace, TV, & BBQ. The GenSuite features a kitchen, living/bedroom, and bath, all accessible through a private entrance. The Grand Opening event will feature local gourmet catering by Bis On Main and complimentary valet parking will be provided for your convenience. Join BDR Fine Homes for a special holiday open house on the North-End of Mercer Island on December 19th from Noon to 6:00pm. 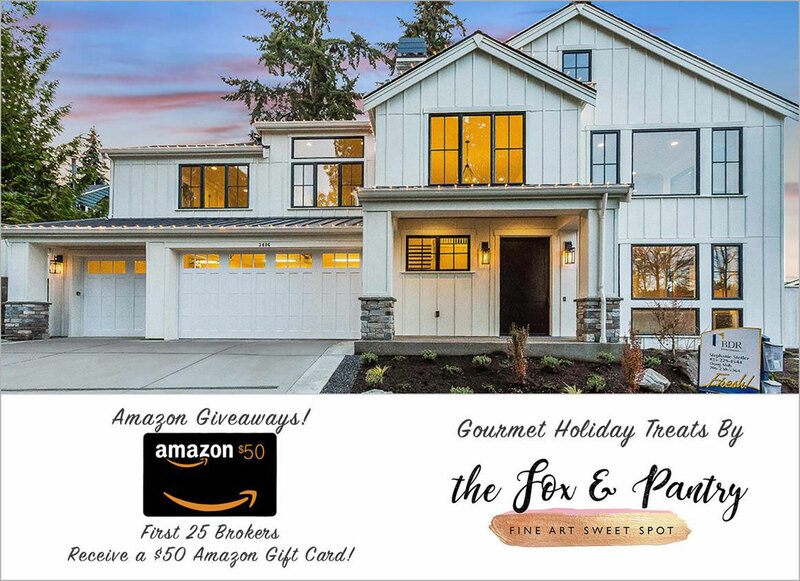 As a holiday gift from BDR Fine Homes to the broker community, the first 25 brokers will receive $50 Amazon gift cards! Enjoy gourmet holiday cider and cookies by The Fox & Pantry while touring this stunning new luxury home. Complimentary valet parking will be provided for your convenience. Nestled down a private lane on the North-End of Mercer Island, this fresh new farmhouse is situated directly adjacent to a new BDR Custom waterfront home. The home features captivating lake views, 4 bedroom suites plus a den, and a signature covered outdoor room complete with heaters, a fireplace, TV & BBQ. A nearby waterfront landing is just steps away for easy access to lake activities and the central location offers a quick connection to downtown Bellevue and Seattle. 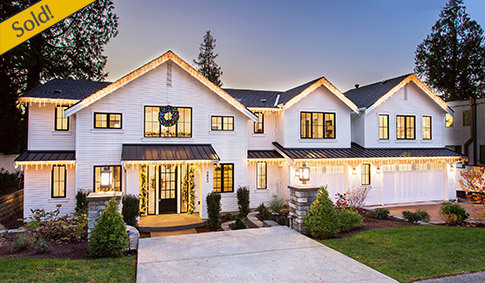 Join BDR Homes for a special holiday twilight open house in Kirkland on December 5th from 4 – 7pm. Watch the sunset over the lake and enjoy roasted gourmet smores, spiced cider, champagne and wine while touring this new modern luxury home. Kirkland’s own Beach House restaurant will be providing the gourmet catering and Metropolitan Market gift cards will be handed out to a select number of visitors. The Kirkland lifestyle is at your front door with Houghton Beach Park, the Beach House restaurant, and Carillon Point just steps away. The home boasts over 3,400 SF of modern open-concept living space with 3 bedrooms plus a den. The signature covered outdoor room features heaters, a fireplace, and TV. Come discover legendary BDR luxury! SEATTLE, Wash. – December 3, 2018– Executives of Realogics Sotheby’s International Realty (RSIR) and BDR Urban jointly announce the listing agreement for Encore at Columbia Station Condominiums – a planned 96-unit community located at 4689 Martin Luther King Jr. Way South in Columbia City. 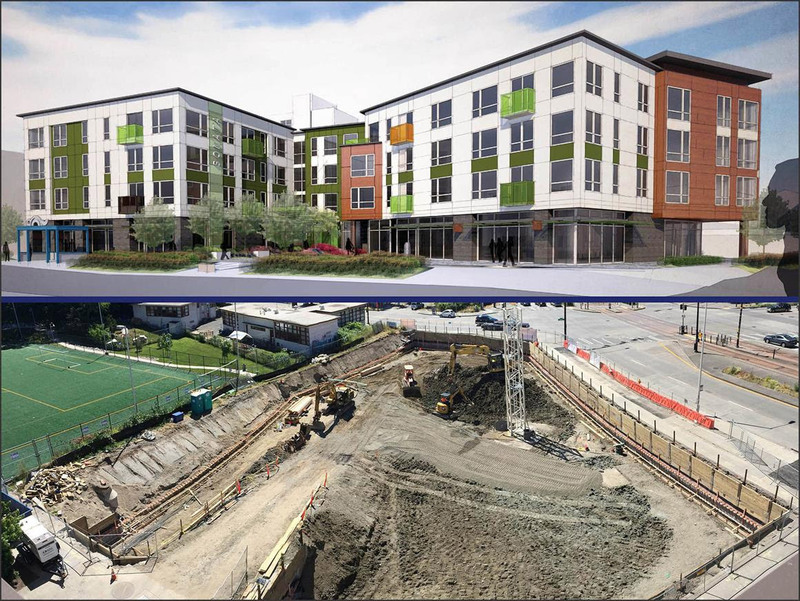 The new multifamily residences will be located adjacent to the Columbia City Station offering quick commutes to urban job centers via LINK Light Rail. In January 2019, RSIR will debut an exclusive release of 25+ attainably priced homes for unit-specific reservations. BDR Urban will also offer qualified homebuyers a rent-to-own opportunity in a first-of-its-kind promotion. Additional inventory will be held for the public sales debut commensurate with the project groundbreaking in spring 2019. Jones noted that much of Columbia City is defined by zoning that encourages multi-level townhome development, single-family homes and a plethora of expensive apartment buildings. Remarkably, the recent development boom proved to be elusive for condominiums in the area, until now. Encore at Columbia Station is designed as a four-story community, which includes an efficiently scaled mix of studio, urban one-, one- and two-bedroom flats (344–966 sq. ft.). Homes will be offered from below $300,000 to more than $700,000. Each residence features voluminous ceiling heights, expansive window walls, engineered hardwood flooring and a European-inspired kitchen with quartz countertops and Bertazzoni stainless steel appliances with induction cooking. Amenities will include concierge services, a coworking lounge, fitness center, great room with exhibition kitchen and a patio. Above all, an expansive rooftop terrace will feature an outdoor BBQ area, an in-building dog run, wrap-around terraces with fireside seating areas and an outdoor theater. The rooftop terrace and many of the homes offer spectacular views of Mt. Rainier. Encore at Columbia Station is located within steps of Columbia City Station, which benefits from the $55 billion Sound Transit 3 expansion. While the full transportation package will take more than a decade to reach completion, the LINK light rail system is currently operational at Columbia City today. Commuters can reach downtown Seattle or Sea Tac International Airport in 15 minutes. As a creative response to Seattle’s affordability challenges, consumers will have an option to rent from BDR Urban’s Sonata Apartments directly across the street from Encore at Columbia Station, with a portion of the lease payment to be credited towards the future purchase price of a condominium. As a two-part transaction, the first twelve (12) qualified homebuyers that reserve and later purchase at Encore at Columbia Station will be granted the opportunity to rent at Sonata Apartments with up to 15 percent of the lease payment being credited back to the homebuyer at closing. These reservation holders can watch their condominium being built across the street while renting at Sonata. 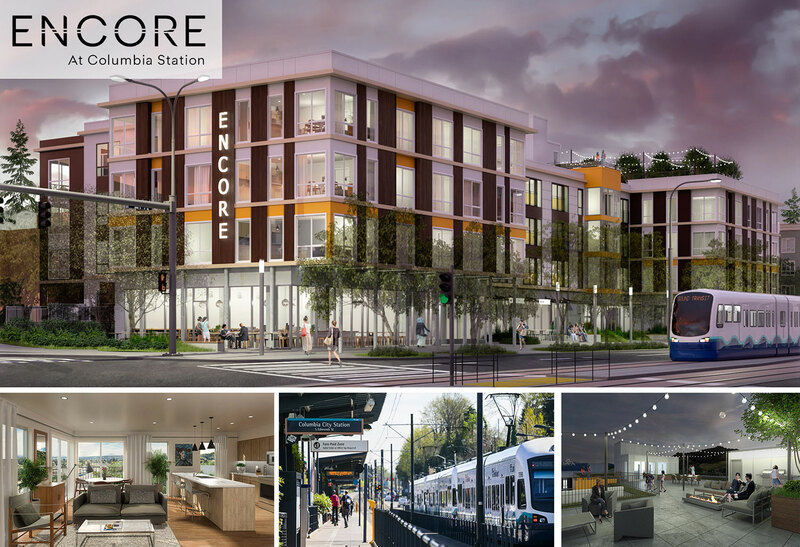 Prospective buyers are invited to preview Encore at Columbia Station during a scheduled public “pop up” open house at the Sonata Apartments located at 3000 S. Alaska Street Way in Columbia City beginning in January 2019. During the event, a limited collection of homes will be offered for unit-specific reservations with set price ranges in exchange for a $5,000 fully-refundable deposit. Reservations will be converted to Purchase and Sale Agreements when the Sales Center opens in the Spring 2019. Tour this newly completed lake view luxury home nestled down a private lane on the North-End of Mercer Island situated directly adjacent to a new BDR Custom waterfront home. This home features captivating lake views, 4 bedroom suites plus a den, and a signature covered outdoor room complete with heaters, a fireplace, TV & BBQ. A nearby waterfront landing is just steps away for easy access to lake activities and the central location offers a quick connection to downtown Bellevue and Seattle. Swing by for a tour and experience legendary BDR luxury and enjoy local gourmet catering by Bis On Main. Complimentary valet parking will be provided for your convenience. BDR Homes was Voted as 425 Magazine's "Best Builder" Last Year, Help Us Win It Back-To-Back This Year! 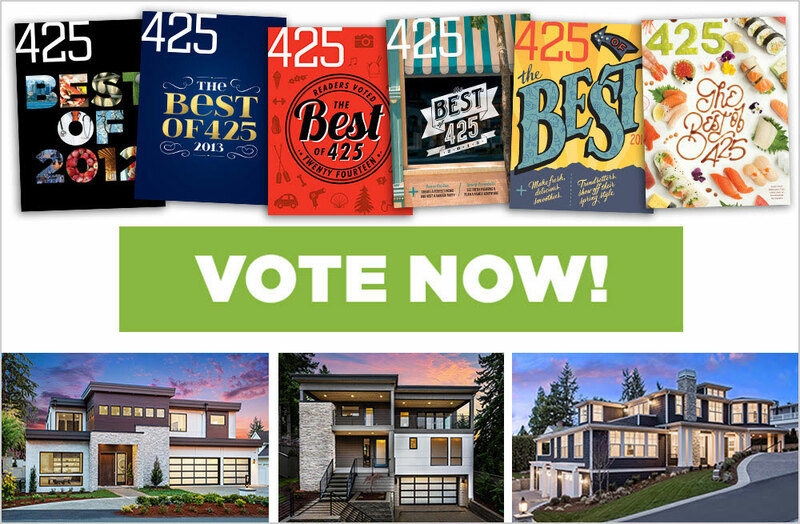 BDR Homes values your opinion and requests your vote again for 425 Magazine’s “Best Builder” award. 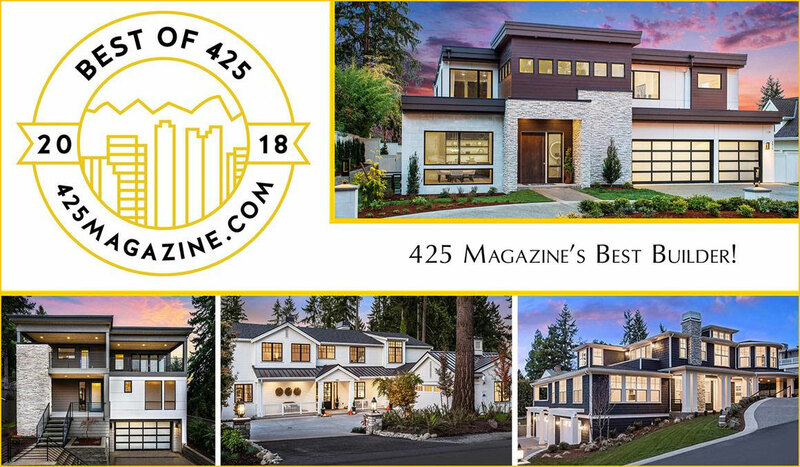 The BDR Homes team is grateful for the recognition and awards they have received in 2018, including the 425 Magazine “Best Builder” award and look forward to serving our partners and customers in the new-year. BDR Homes experienced a banner year in Eastside home building, setting numerous sales records throughout the year and recently being recognized with 6 home design and sales awards at the annual New Home Tribute Awards. BDR Homes specializes in building townhome and single family home communities in the Eastside’s most desirable neighborhoods with a quick connection to the regions top employers. The BDR team has over 400 years of collective home building experiences and is the proud recipient of numerous awards for building excellence. Click Here to Vote for BDR Homes as the Eastside's Best Home Builder! The newly completed Brio townhomes are situated in the very best location in Greenbridge, as each townhome is nestled in a park-like greenbelt setting, adjacent to schools, parks, and community trails. The townhomes feature private fenced-in backyards and unique signature covered outdoor rooms complete with heaters for year-round living. 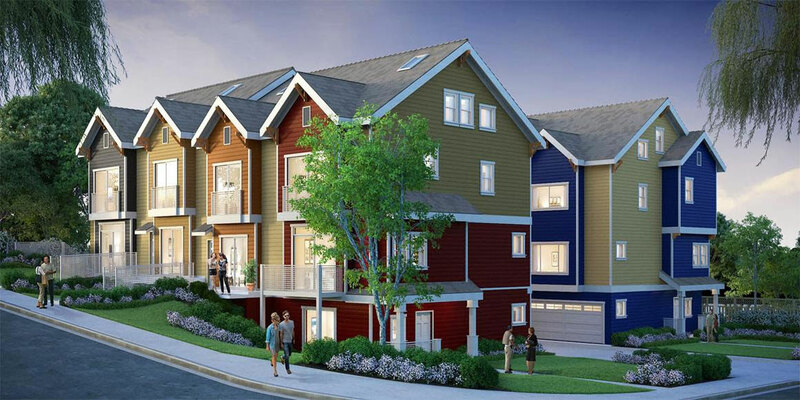 The spacious 2-story townhomes feature flexible open-concept 2 & 3 bedroom layouts with BDR luxury features throughout. Discover attainable new construction luxury at Greenbridge, a charming and safe community located just 12 minutes from downtown Seattle! Come discover what the buzz is all about in Southwest Seattle! BDR Capital Partners LLC (“BDR”) specializes in forming Investment LLC’s to invest in real estate development projects in Seattle. The Chairman and Founder of BDR (“Sponsor”) has over 30 years of experience in the Seattle area building community. Sponsor has received numerous national and regional awards for building excellence, including National Gold Nugget Awards, membership in the Building Industry Hall of Fame and a three (3) time Builder of the Year award winner in Seattle. Since 2010, BDR has completed Ninety-One (91) separate investment offerings for real estate development projects in the Seattle area. Forty-Six (46) of these projects have been built, sold and closed out (“Completed Projects”). Investors in Completed Projects have received on average a total annual return in excess of 20%. BDR Capital Partners is affiliated with BDR Holdings LLC, a diversified real estate development company specializing in innovative real estate development projects throughout the Puget Sound region. Investors in BDR projects are required to warrant that they are Accredited Investors as outlined in the Securities Act of 1933. Verification of Accredited Investor status will be required prior to any purchase of BDR securities. BDR Homes was honored with 6 new home industry awards last night at the 2018 New Home Council Tribute Awards. 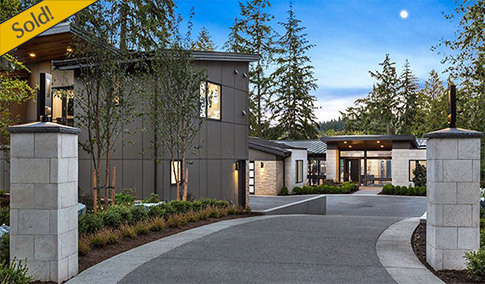 The Tribute Awards celebrated its 10th anniversary recognizing excellence in new home design, staging, marketing, and sales in the Puget Sound region. The BDR Homes team is grateful and honored to receive these awards and to serve our partners and customers on the Eastside and throughout the Puget Sound. 1313 Market Street, Kirkland | Stay Tuned to Reserve a Townhome! Pre-Sale reservations will be happening soon for the Market Townhomes situated in Kirkland’s coveted West of Market neighborhood! Stay tuned for the opportunity to reserve one of 8 modern luxury townhomes situated steps from the shopping, dining, and entertainment of downtown Kirkland. The Market Townhomes will be completed in the Summer of 2019. Join BDR Homes for a special Grand Opening event in Kirkland on September 19th from 11am – 7pm. Tour this newly completed modern lake view luxury home while enjoying gourmet catering by Kirkland’s own Beach House Restaurant. The Kirkland lifestyle is at your front door with the Beach House restaurant, Houghton Beach Park, and Carillon Point just steps away. The home boasts over 3,400 SF of modern open-concept living space with 3 bedrooms plus a den. The signature covered outdoor room features heaters, a fireplace, and TV. Come discover BDR luxury! Complimentary valet parking will be provided for your convenience. Join BDR Urban for a special Grand Opening event in Seattle’s treasured Seward Park neighborhood on Thursday, August 30th from 11am – 7pm. Discover captivating Lake Washington and Mt. Baker views from this newly completed modern luxury home offering 4 bedrooms plus a den. The home features multiple outdoor entertainment spaces, including a signature covered outdoor room with heaters, a fireplace, and TV and a roof-top terrace with panoramic views. 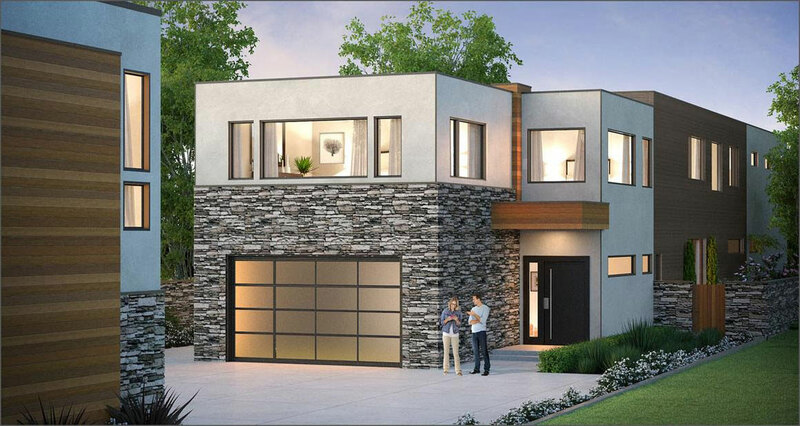 Come and enjoy local gourmet food by Tom Douglas Catering while touring this stunning new modern luxury home! Complimentary valet parking will be provided for your convenience. 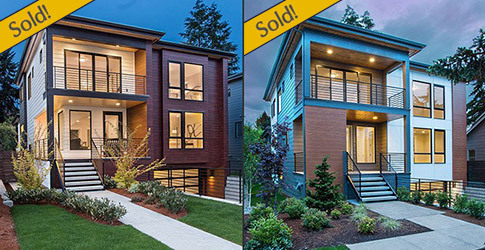 Introducing 3 fresh new luxury homes in Kirkland! Each home features a signature covered outdoor room complete with heaters, a fireplace, and TV. The chef’s kitchens feature professional grade appliances and gourmet islands and the luxurious master suites feature spa-inspired baths. These fresh new homes are centrally located minutes from downtown Kirkland, the Kirkland Google Campus, and the Microsoft Redmond campus. BDR Homes specializes in building townhome and single family home communities in the Eastside’s most desirable neighborhoods with a quick connection to the regions top employers. 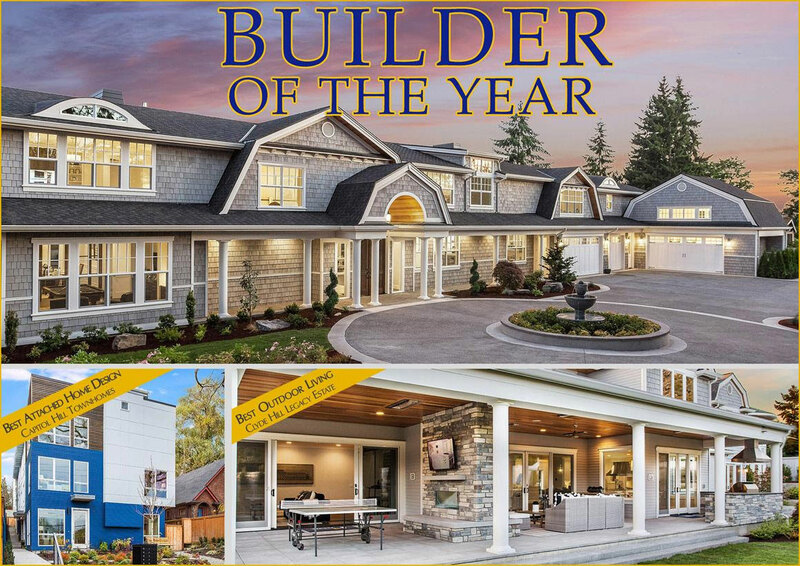 The BDR team has over 400 years of collective home building experiences and are the proud recipients of numerous awards for building excellence, including the 425 Magazine 2018 “Best Builder” award. 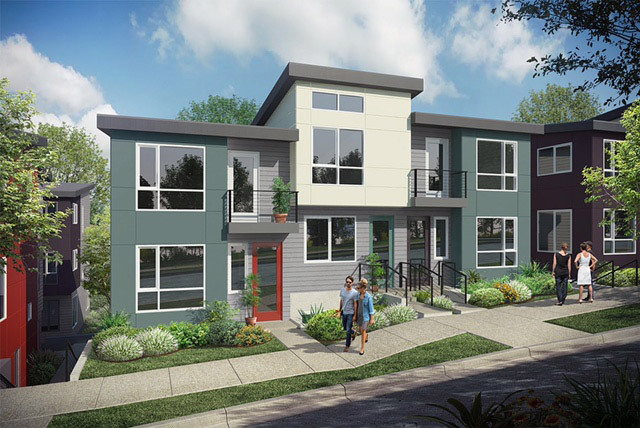 BDR Urban is excited to announce the start of construction of 24 modern townhomes situated in the Highland Park neighborhood of Southwestern Seattle. The 3 bedroom townhomes will feature open-concept layouts, gourmet kitchens, incorporated technology, and private roof-top outdoor living areas! The townhomes are centrally located within walking distance to nearby shopping, dining, and entertainment, while downtown Seattle is only 12 minutes away! Join BDR Homes for a special Grand Opening event on Wednesday July 18th from 11am – 7pm. Tour the newly completed lake view townhomes situated in the heart of Kirkland’s treasured East of Market neighborhood, just steps from vibrant downtown Kirkland! 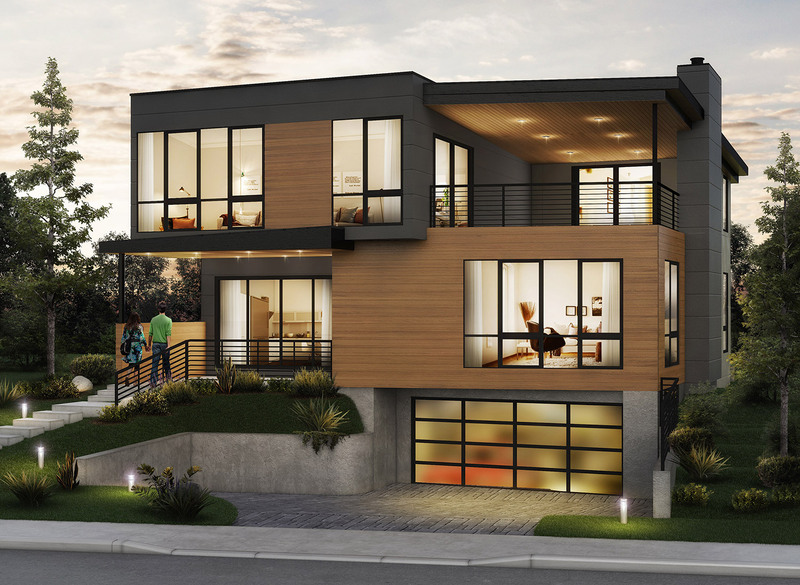 The townhomes feature expansive roof-top terraces with sweeping Lake Washington views. The open-concept 3 bedroom townhomes offer over 2,700 SF of luxurious living space. Come discover BDR luxury and enjoy local gourmet catering by Bis on Main! Join BDR Urban for a special Grand Opening event today from 11am – 7pm. Tour the newly completed Capriccio model home while enjoying local gourmet treats by Greenbridge Cafe and Lady Yum macarons! Capriccio is a new community comprised of 13 fresh home designs located in the master-planned Greenbridge neighborhood in southwestern Seattle. The Capriccio homes feature 3 & 4 bedroom plans, open-concept layouts, luxurious kitchens with large gourmet islands, covered outdoor rooms, and much more! 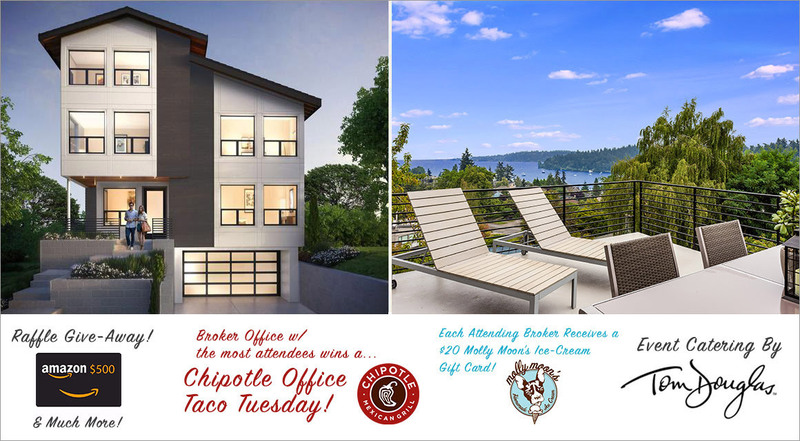 Join BDR Homes for a special Grand Opening event in Kirkland on June 20th from 11am – 7pm. Tour this newly completed modern luxury home featuring panoramic Lake Washington and Seattle skyline views. The Kirkland lifestyle is at your front door with the Beach House restaurant, Houghton Beach Park, and Carillon Point just steps away. The home features an expansive roof-top entertainment deck complete with a fireplace and a signature covered outdoor room with overhead heaters and TV. The home features over 4,100 SF of open-concept living space with 4 bedrooms plus a den and a bonus room. Come discover BDR luxury and enjoy local gourmet appetizers by the Beach House restaurant! Join BDR Fine Homes for a special Grand Opening event on June 7th from 11am – 7pm. 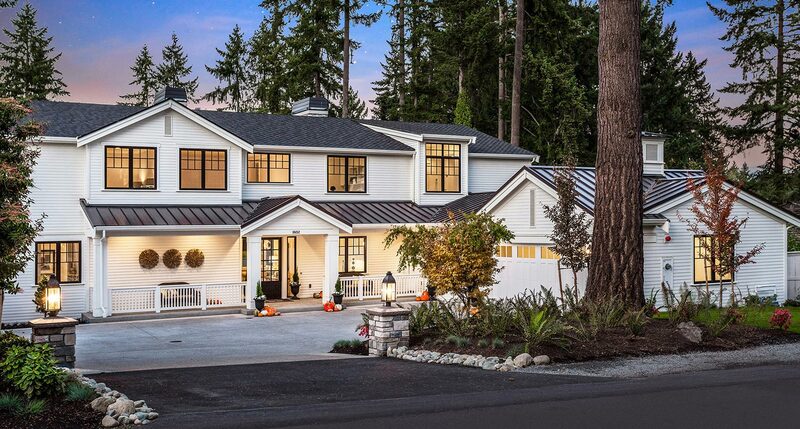 Tour this newly completed luxury home situated in the heart of West Bellevue. Offering 4 bedroom suites plus a den, the home features a sunny and flat backyard and a signature outdoor room with heaters, a fireplace, TV, & BBQ. The chef’s kitchen is equipped with professional grade appliances and a separate prep-kitchen. The Grand Opening event will feature local gourmet catering by Bis On Main and complimentary valet parking will be provided for your convenience. Introducing 9 fresh new luxury townhomes in Kirkland’s coveted West of Market neighborhood, situated steps from the shopping, dining, and entertainment of downtown Kirkland and Marina Park. The 3 bedroom townhomes offer over 2,800 SF of luxurious living space and feature chef’s kitchens with professional grade appliances and gourmet islands. The townhomes also feature private outdoor rooms complete with fireplaces and attached 2-car garages. 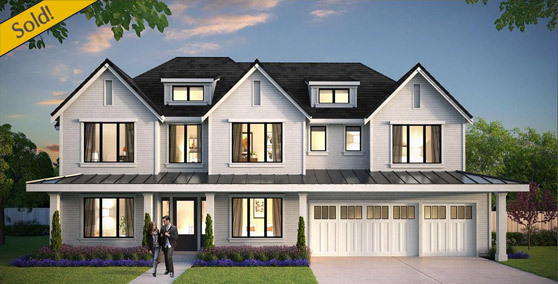 Introducing two fresh new luxury homes in the heart of the treasured Yarrow Point community. The homes feature expansive covered outdoor rooms designed for year-round living, featuring heaters, a fireplace, TV, and BBQ. The signature chef’s kitchen’s are equipped with professional grade appliances and feature large gourmet islands. The central location offers a quick connection to downtown Bellevue, downtown Seattle, and the nearby award winning schools. These luxury homes will be completed in the Spring of 2019. 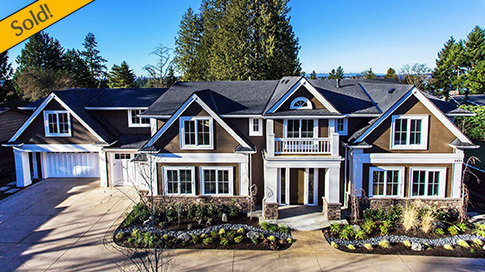 BDR Fine Homes specializes in building luxury homes in the exclusive communities of West Bellevue, Clyde Hill, Medina, Yarrow Point, and Mercer Island. Uniquely designed and featuring the latest in high-end finishes and incorporated technology, BDR Fine Homes offer the very finest in luxury living. The BDR team has over 400 years of collective home building experiences and are the proud recipients of numerous awards for building excellence, including the 2018 425 Magazine “Best Builder” award. Thank you to our followers and friends who voted for BDR Homes as 425’s “Best Builder”! The BDR Homes Team is grateful and honored to receive this award and to serve our partners and customers on the Eastside and throughout the Puget Sound region. BDR Homes has experienced a banner season in Eastside home building, setting numerous sales records and being awarded as Builder of the Year at the annual New Home Tribute Awards last Fall. Also, Todd Bennett, the Founder & Chairman of BDR Homes, was recently honored with the Legacy Award by the Builders Council and was also inducted into the Master Builders Association Hall of Fame. 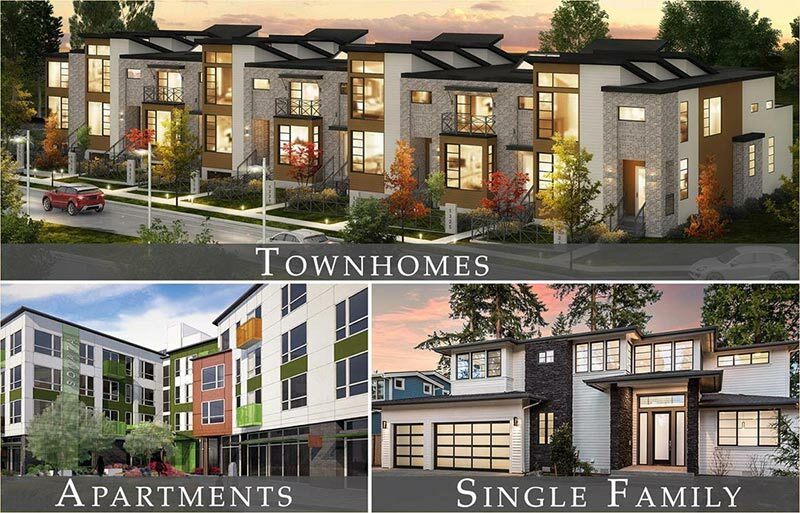 BDR Homes specializes in building townhome and single family home communities in the Eastside’s most desirable neighborhoods with a quick connection to the regions top employers. The BDR team has over 400 years of collective home building experiences and are the proud recipients of numerous awards for building excellence. 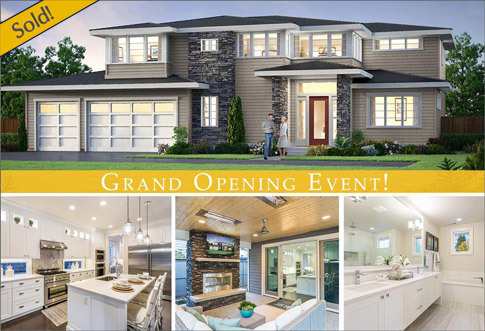 Join BDR Homes for a special Grand Opening event in Kirkland on April 25th from 11am – 7pm. Tour this newly completed modern luxury home featuring panoramic Lake Washington and Seattle skyline views. The Kirkland lifestyle is at your front door with the Beach House restaurant, Houghton Beach Park, and Carillon Point just steps away. The home features an expansive roof-top entertainment deck complete with a fireplace. The chef’s kitchen is equipped with professional grade appliances and a large gourmet island. The home features over 2,800 SF of open-concept living space with 3 bedrooms plus a flex room. Come discover BDR luxury and enjoy local gourmet appetizers by Kirkland’s own Beach House Restaurant and treats by Lady Yum! Join BDR Fine Homes for a special Grand Opening event on April 19th from 11am – 7pm. Tour this newly completed modern luxury home situated in the heart of Clyde Hill. Offering over 6,000 SF with 5 bedroom suites plus a den, the home features an elegant drive court, a sunny and flat backyard, and a signature outdoor room with heaters, a fireplace, TV, & BBQ. The chef’s kitchen is equipped with professional grade appliances and a separate prep-kitchen. Additional luxury features include a media room, wine grotto, and bonus room with a signature snack-shop. The Grand Opening event will feature local gourmet catering and complimentary valet parking will be provided for your convenience. 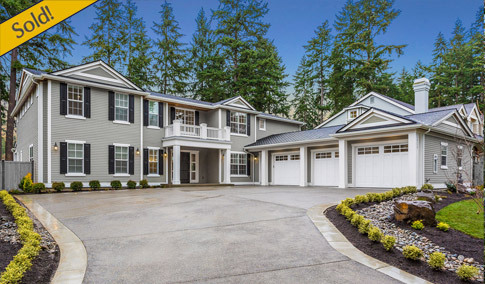 BDR Fine Homes specializes in building luxury homes in the exclusive communities of West Bellevue, Clyde Hill, Medina, Yarrow Point, and Mercer Island. Uniquely designed and featuring the latest in high-end finishes and incorporated technology, BDR Fine Homes offer the very finest in luxury living. The BDR team has over 400 years of collective home building experiences and are the proud recipients of numerous awards for building excellence. Join BDR Urban for a special Grand Opening event on Saturday March 31st from 11am – 7pm. Tour the newly completed Capitol Hill modern luxury home featuring an expansive roof-top entertainment deck with sweeping views and a signature covered outdoor room with heaters, a fireplace, and TV. The home offers 3,696 SF of flexible living space, 4 bedrooms with 4.5 baths, a gourmet chef’s kitchen, and a large bonus room with signature snack-shop. The close-in location offers a quick connection to South Lake Union and Downtown Seattle, while being nearby the renowned dining and entertainment of Capitol Hill. The Principals of BDR Urban have won the “Builder of the Year Award” in the Puget Sound Region three (3) times. BDR Urban is looking for land in Seattle for high quality apartment, townhome and single family home projects. 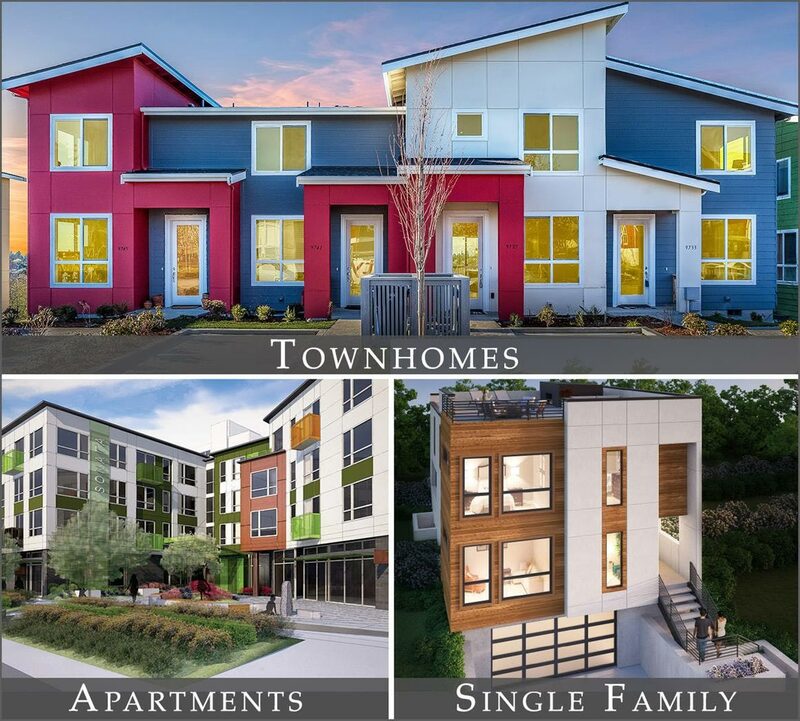 The principals of BDR Urban have been building residential communities in the Seattle area for over 30 years. 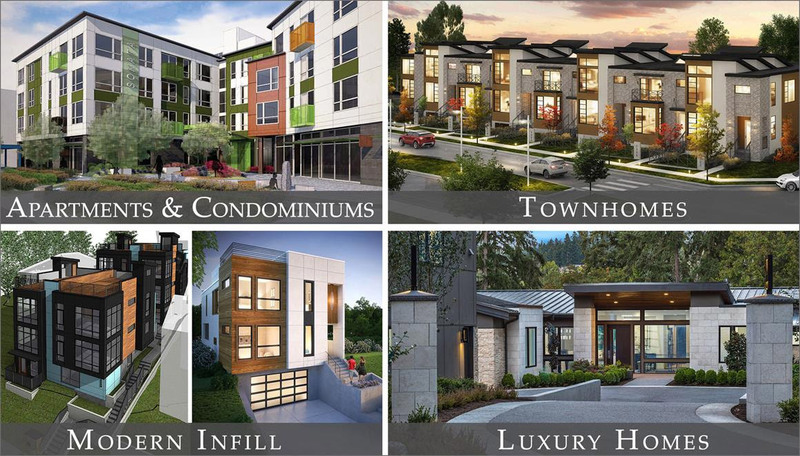 BDR Urban is currently building eight (8) projects in Seattle. BDR Urban specializes in building apartment, townhome and single family home communities in Seattle near transit hubs and employment centers. Fresh New Designs Coming to a Seattle Neighborhood Near You! BDR Urban is pleased to introduce the 2018 Seattle Collection offering exceptional new housing choices in Seattle’s hottest neighborhoods. 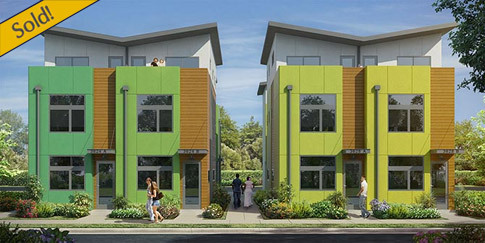 Featuring open-concept designs, unique outdoor living spaces, and incorporated technology, BDR Urban offers the most complete range of housing options in the Seattle area. BDR Custom Homes is pleased to announce the start of construction of a fresh new custom farmhouse in Bellevue. The home offers over 4,700 square feet of luxurious living space and features numerous BDR Custom Home design innovations. The home is being built under BDR Custom Homes special “On Your Lot®” building program that provides an integrated approach to the custom home experience. The client developed a custom home plan tailored to their individual needs through working with BDR’s in-house architecture and design team. 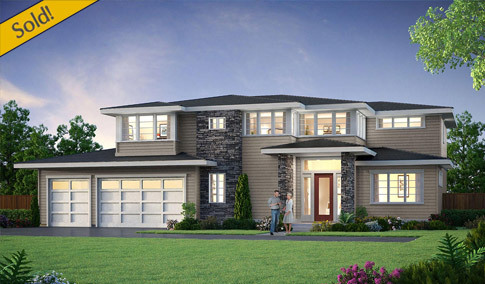 BDR Custom Homes also offers an extensive library of award winning ready-to-build home plans. The home will be built utilizing the latest in management efficiencies and technology by BDR’s Team of professionals who have over 400 years of collective home building experiences. The principals of BDR Custom Homes have won the “Builder of the Year” award in the Puget Sound region three (3) times. 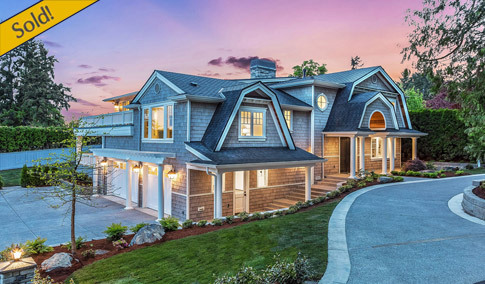 BDR Custom Homes LLC is a wholly owned subsidiary of BDR Holdings LLC, a diversified real estate company specializing in innovative housing projects throughout the Puget Sound region. 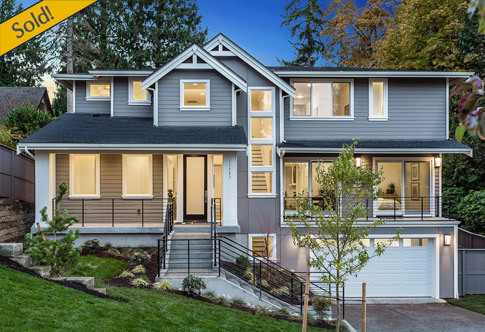 BDR Custom Homes is pleased to announce the completion of a fresh new Dutch Colonial custom home situated on the shores of Lake Washington on the North-end of Mercer Island. The home offers over 7,100 square feet of luxurious living space and features numerous BDR Custom Home design innovations. The home is being built under BDR Custom Homes special “On Your Lot®” building program that provides an integrated approach to the custom home experience. The client developed a custom home plan tailored to their individual needs through working with BDR’s in-house architecture and design team. 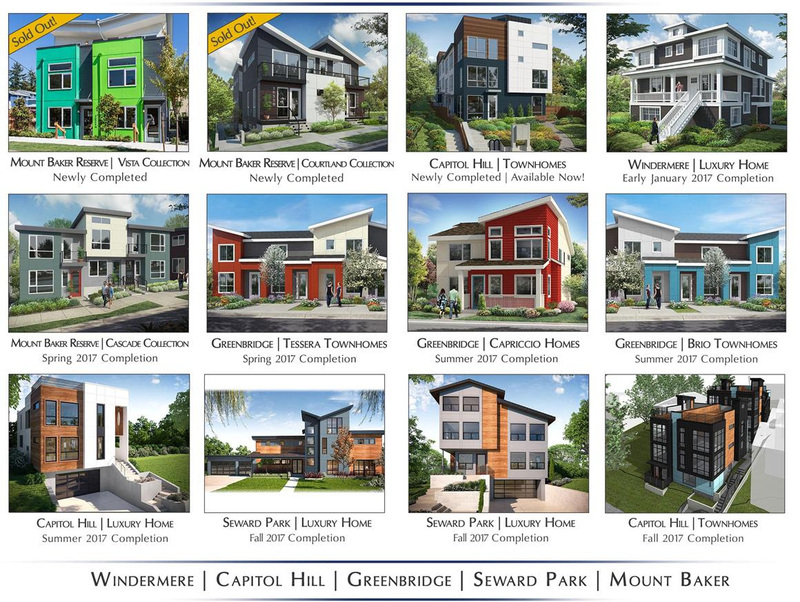 BDR Custom Homes also offers an extensive library of award winning ready-to-build home plans to choose from. The home was built utilizing the latest in management efficiencies and technology by BDR’s Team of professionals who have over 400 years of collective home building experiences. The principals of BDR Custom Homes have won the “Builder of the Year” award in the Puget Sound region three (3) times. BDR Custom Homes is pleased to announce the start of construction of a fresh new custom home designed by Scott Bennett situated on the shores of Lake Washington in Kirkland. The home offers over 5,000 square feet of luxurious living space and features numerous BDR Custom Home design innovations. The home will be built utilizing the latest in management efficiencies and technology by BDR’s Team of professionals who have over 400 years of collective home building experiences. The client will experience the peace of mind and added value of a home built by a builder who has been in business for over 30 years and is a 3 time “Builder of the Year” winner in the Puget Sound Region. BDR Urban announces Design Approval of Sonata West, a new 96 unit “mixed-use” apartment community located in the vibrant Columbia City neighborhood of Seattle, adjacent to the new Columbia City light rail station. The community will be constructed to “4-Star Built Green” standards, will feature modern studio, 1 & 2 bedroom apartment homes and will include an expansive roof top entertainment deck. It is anticipated the total project costs will be approximately 30 million dollars. Sonata West apartments and retail spaces will be available for occupancy in the Summer of 2020. 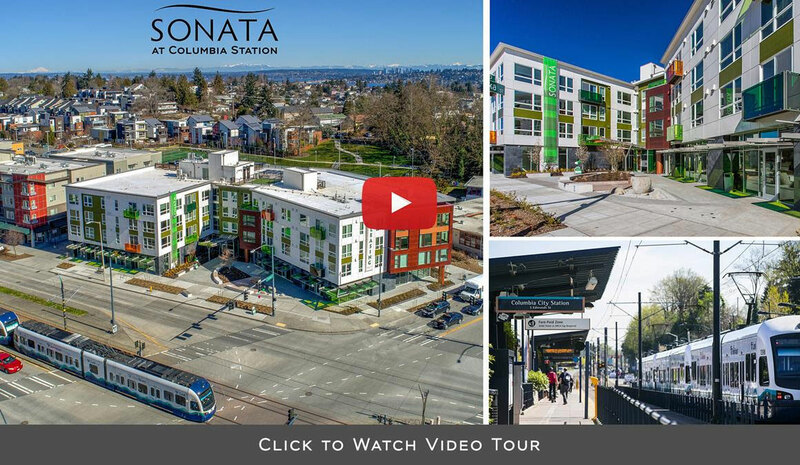 The Sonata West Project is situated at the northwest corner of the intersection of MLK Jr. Way and Alaskan Way, adjacent to the Columbia City Light Rail Station. Sonata West is also located directly across the street from Sonata East, a new 91 unit “mixed-use” apartment community that BDR Urban is now building. BDR Urban is the developer of the Sonata West project. The Architect is NK Architects of Seattle. BDR Urban builds apartment, townhome, and single-family home communities in Seattle near transit hubs and employment centers. BDR Urban has been involved in numerous housing projects in Seattle since 2006, including eleven (11) projects in the Columbia City Neighborhood. Situated in the heart of Kirkland’s treasured Forbes Creek neighborhood, this new luxury home boasts a large, flat, western-oriented backyard and features over 3,500 SF with 4 bedroom suites plus a den. The chef’s kitchen is equipped with professional grade appliances and features a large gourmet island perfect for entertaining. The signature covered outdoor room is designed for year-round living, featuring heaters, a fireplace, and TV. Come discover BDR luxury and enjoy local gourmet appetizers and desserts! BDR Homes specializes in building apartment, townhome and single family home communities on the Eastside near transit hubs and employment centers. The BDR team has over 400 years of collective home building experiences and are the proud recipients of numerous awards for building excellence. BDR Homes is looking for land in Kirkland for high quality apartment, townhome and single family home communities. The principals of BDR Homes have been building residential communities on the Eastside for over 30 years. 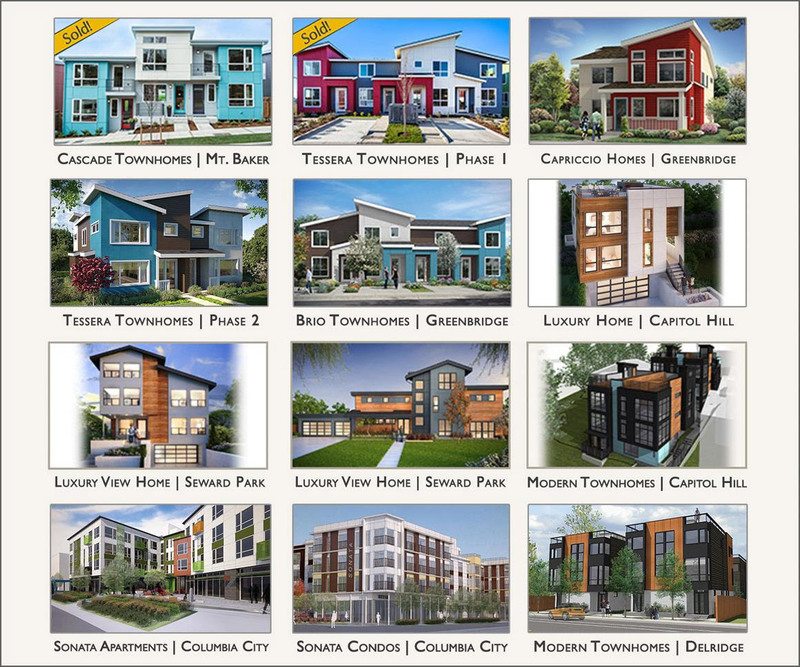 BDR Homes is currently building nine (9) projects in Kirkland. BDR Homes specializes in building apartment, townhome and single family home communities on the Eastside near transit hubs and employment centers. BDR Homes is a wholly owned subsidiary of BDR Holdings LLC, a diversified real estate development company specializing in innovative housing communities throughout the Puget Sound region. The Principals of BDR Homes have won the “Builder of the Year Award” in the Puget Sound Region three (3) times. BDR Custom Homes specializes in building expertly crafted luxury homes on privately owned building lots. 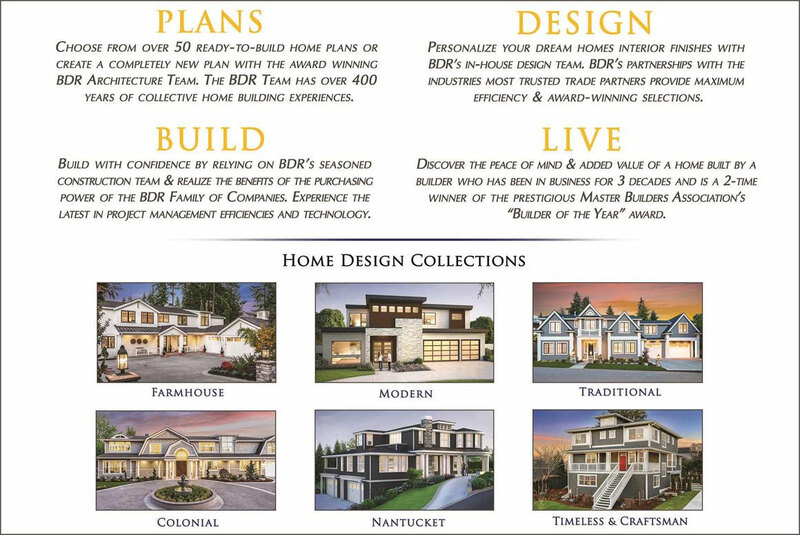 Choose a unique home design from BDR’s extensive library of ready-to-build plans or work alongside BDR’s award winning architecture team and design a completely new plan. Utilizing a team approach with over 400 years of collective home building experiences and integrated purchasing, BDR Custom Homes provides an excellent balance of quality and value. BDR was recently awarded as Builder of the Year at the annual Home Builder Tribute Awards. Click Here to Learn More About Building "On Your Lot"
BDR Homes was honored with the prestigious Builder of the Year Award at the 2017 Annual Home Builder Tribute Awards. The Tribute Awards recognize excellence in new home construction, design, and marketing in the Puget Sound region. 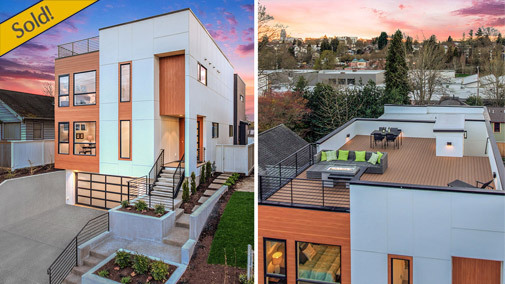 In addition to being recognized as Builder of the Year, BDR Homes was awarded with the Best Attached Home Design for the Capitol Hill modern townhomes & the Best Outdoor Living Space award for the Clyde Hill Legacy Estate! 5704 S Hawthorn Road, Seattle | Coming Spring 2018! 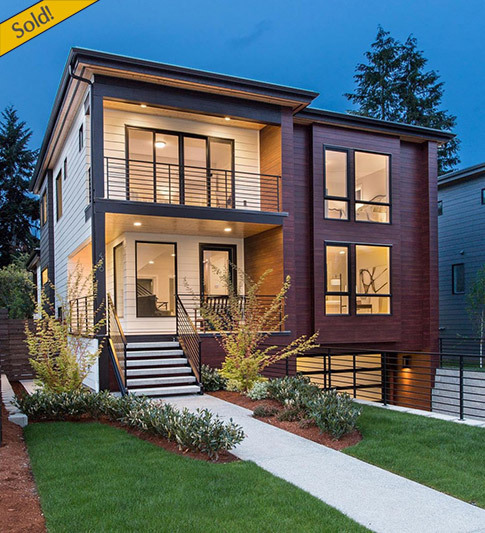 Situated only a short walk from Seward Park on the shores of Lake Washington, this modern design by BDR Urban boasts over 4,100 SF and 4 bedrooms plus a den. The home is designed around the captivating panoramic views. An entertainers dream, the home features multiple outdoor living areas, including a signature covered outdoor room complete with heaters, a fireplace, and TV, as well as a large roof-top terrace. The chef’s kitchen is equipped with professional grade appliances and features a large gourmet island with bar seating. The Seward Park neighborhood is conveniently located only a short drive or ride from downtown Seattle via the nearby light rail stations. BDR Urban builds apartment, townhome, and single family home communities in Seattle near transit hubs and employment centers. BDR Urban has been involved in numerous housing projects in Seattle since 2006, including 11 projects in the Columbia City neighborhood. Situated in the heart of Kirkland’s treasured Rose Hill neighborhood, this new luxury home boasts over 3,700 SF and features 4 bedroom suites plus a den. The chef’s kitchen is equipped with professional grade appliances and features a separate prep-kitchen. The large covered outdoor room is designed for year-round living, featuring heaters, a fireplace, and TV. The Grand Opening event will feature local gourmet catering by the Beach House restaurant! BDR Homes specializes in building townhome and single-family homes in the greater Seattle & Eastside areas fastest growing communities. Situated near major employment centers, BDR Homes projects are uniquely designed and feature the latest in home technology. The BDR team has over 400 years of collective home building experiences and are the proud recipients of numerous awards for building excellence. Introducing a fresh new farmhouse design on the North-End of Mercer Island. Featuring over 4,400 sq. ft. and 4 bedrooms suites plus a den, this home is equipped with a chef’s kitchen featuring professional grade appliances and a separate prep kitchen. The expansive covered outdoor room features heaters, a fireplace, TV, and BBQ. The central location is within walking distance to downtown Mercer Island, Luther Burbank Park, and the newly completed Community Center. This luxury home will be completed in the Spring of 2018. Situated in the heart of West Bellevue’s treasured Enatai community, this new luxury home boasts over 5,400 SF and features 5 bedroom suites plus a den. The signature GenSuite features a full kitchen, living room, bedroom, and bath, all accessible through a private entrance. The chef’s kitchen is equipped with professional grade appliances and a separate prep-kitchen. The signature covered outdoor room is designed for year-round living, featuring heaters, a fireplace, TV, and BBQ. The Grand Opening event will feature local gourmet food and beverages provided by Bis On Main. For your convenience complimentary valet parking will be provided. Featuring over 6,600 SF and 5 bedroom suites plus a den, this new traditional luxury home features a chef’s kitchen equipped with professional grade appliances and a separate prep kitchen, an expansive covered outdoor room, a wine grotto, exercise room, and additional BDR signature features. Situated in the heart Medina, this home is within walking distance to Overlake Country Club, nearby parks, and the award winning Medina Elementary School. This luxury home will be completed in the Summer of 2018. Featuring over 3,600 SF and 4 bedroom suites plus a den, this new modern luxury home offers two distinct outdoor living areas, including a signature covered outdoor room complete with heaters, a fireplace, and TV, as well as a large roof-top deck featuring a stone fireplace. Expansive Mt. Rainier and Cascade mountain views are seen from many of the main living areas and bedrooms. The chef’s kitchen is equipped with professional grade appliances and features a large center island. The close-in location offers a quick connection to downtown Seattle and to the entertainment and dining available on Capitol Hill. This modern luxury home will be completed in the Spring of 2018. BDR Urban builds apartment, townhome, and single family home communities in Seattle near transit hubs and employment centers. BDR Urban has been involved in numerous housing projects in Seattle since 2006. Offering over 3,700 SF and 4 bedrooms plus a den, this new modern luxury home features multiple outdoor entertainment areas, including a signature covered outdoor room complete with heaters, a fireplace, and TV, as well as an additional outdoor room adjacent to the master suite and a roof-top terrace. Panoramic views of Seward Park and Lake Washington are seen from most living areas and bedrooms. The chef’s kitchen is equipped with professional grade appliances and a features a large center island. The home is situated steps from Seward Park and is minutes from downtown Seattle via the nearby light rail stations. This modern luxury home will be completed in the Spring of 2018. 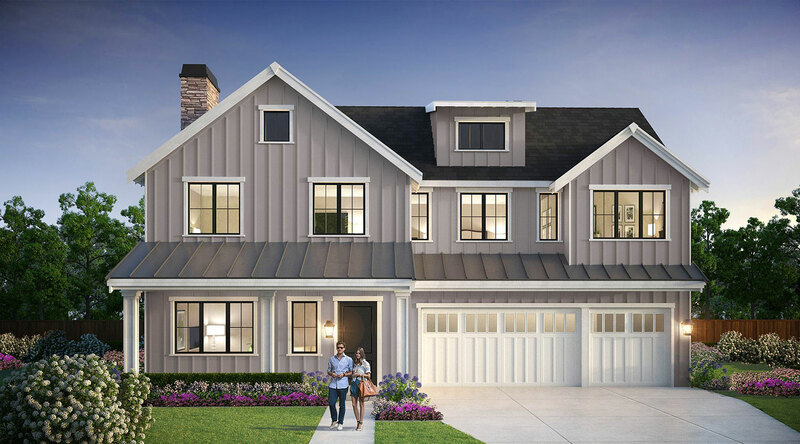 Featuring over 4,300 SF and 4 bedroom suites plus a den, this new luxury farmhouse features a chef’s kitchen equipped with professional grade appliances and a separate prep kitchen, an expansive covered outdoor room, and additional BDR signature features. Situated in the heart of the coveted Enatai neighborhood, this home is within walking distance to the newly completed award-winning Enatai Elementary School! This luxury home will be completed in the Spring of 2018. The approximately 7,000 square foot home is situated on 100′ of premier waterfront on the north-end of Mercer island. The home features a great room layout with most living areas afforded an excellent lake view, a large covered outdoor entertainment room, and other BDR special touches. The home is scheduled to be completed within 12 months. BDR Custom Homes specializes in building homes on privately owned building lots. 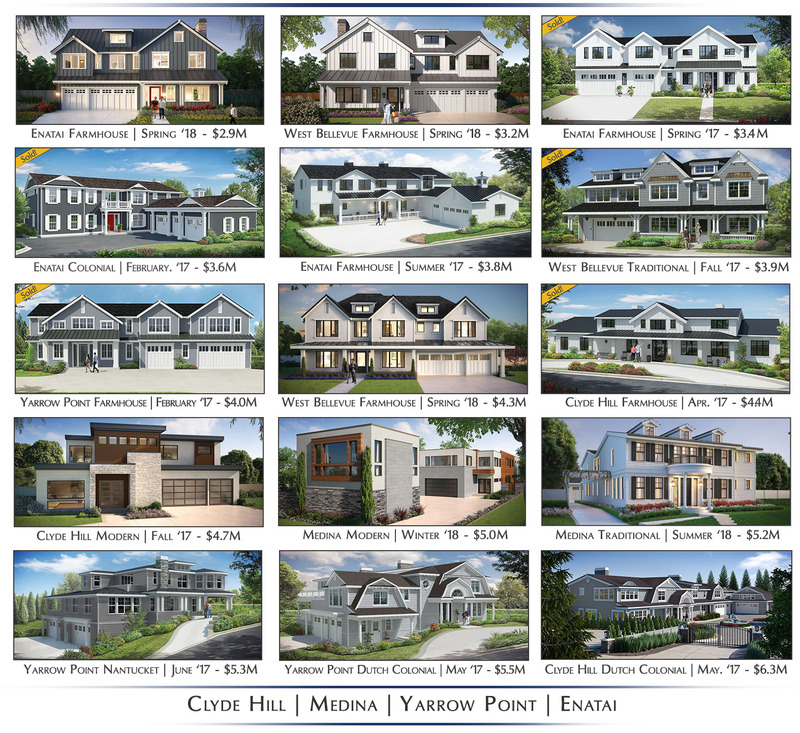 BDR Custom Homes builds home plans selected from its own extensive library of custom home plans, home plans prepared by BDR’s in-house design team, or home plans provided by outside architecture firms. Utilizing a team approach and integrated purchasing, BDR Custom Homes provides an excellent balance between quality and value. BDR Urban announces the start of construction of Sonata, a new 91 unit mixed use apartment community in the heart of the Columbia City Neighborhood, adjacent to the new Columbia City Light Rail Station. The community will be constructed to “Built Green” standards, and will feature modern studio, 1 & 2 bedroom apartment homes. The architect for the project is NK Architects of Seattle, the contractor is Venture General Contracting LLC, and property management services are being provided by Coast Real Estate Services. Apartments and retail spaces will be available for occupancy in the Summer of 2018. Join us for the Grand Opening of this new Dutch Colonial legacy estate in the heart of Clyde Hill. Situated on an expansive 30K SF lot, this new luxury home features a private gated entry that leads to a large circular drive court with a beautiful focal fountain. The home boasts over 9,100SF with 6 bedroom suites plus a den and a 5 car garage. The signature GenSuite features a full kitchen, living room, bedroom and bath, all accessible through a private entrance. Offering the very finest in luxury living, this home features a chef’s kitchen w/ professional grade appliances and a signature covered outdoor living room complete with heaters, a fireplace, TV, and BBQ. The Grand Opening event will feature local gourmet food and beverages provided by Bis On Main. For your convenience complimentary valet parking will be provided. Introducing a fresh new luxury farmhouse located down a private lane on the North-End of Mercer Island. Offering over 3,700 SF, this home features 4 bedroom suites plus a den and features some lake views. The expansive signature covered outdoor room is designed for year-round living, featuring heaters, a fireplace, TV, and BBQ. The chef’s kitchen is equipped with professional grade appliances and features a large center island perfect for preparing and entertaining. The flexible open-concept floor plan is tailored for modern living, featuring a large great room that flows seamlessly into the kitchen and outdoor room. The award winning Mercer Island schools are a short drive away and the areas many community parks are located nearby. The central location offers a quick connection to downtown Seattle, while downtown Bellevue is only a 5 minute drive away. This luxury home will be completed in the Spring of 2018. Located at the end of a quiet private lane on the west side of Yarrow Point, this fresh new Dutch Colonial luxury home resides on a 19K SF lot with western orientation and features some lake views. The expansive covered outdoor room is designed for year-round living and entertaining, featuring heaters, a fireplace, TV, and BBQ. The private yard allows for outdoor sports areas and features an intimate spa area. Extended stay guests will feel right at home in the signature Gensuite, featuring a private kitchen, bed/living room with fireplace, and bathroom. Additional luxury features include a chef’s kitchen with professional grade appliances, a dedicated exercise room, and a wine grotto. 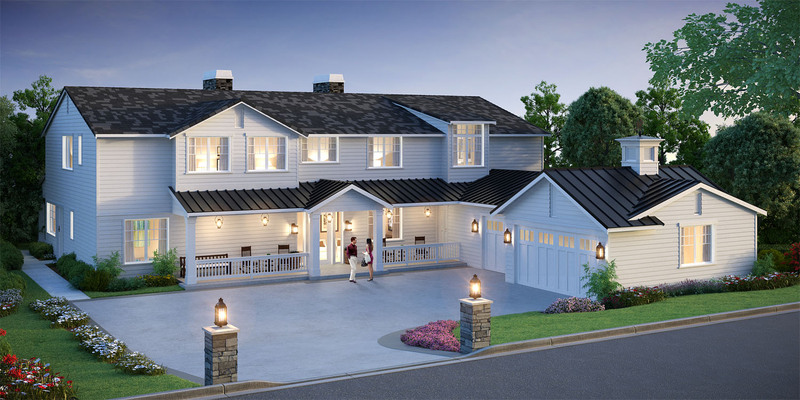 Introducing a fresh new farmhouse design by BDR Fine Homes, centrally located on Mercer Island. This new luxury home boasts over 4,400 Sq. Ft. and features 4 bedroom suites plus a den. From the elegant kitchen equipped with top of the line appliances and a separate prep-kitchen, to the private master suite with a spa-like bath, this new offering from BDR Fine Homes presents the very finest in luxury living. The expansive signature covered outdoor room is tailored for year-round living, featuring heaters, a fireplace, TV, and BBQ. This home is centrally located within walking distance to numerous parks and is blocks from a shopping center and Mercer Island’s award winning schools. This new luxury home will be completed in the Fall of 2017. 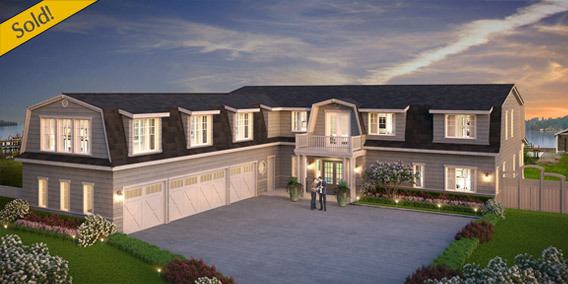 Discover the very finest in luxury living with this new farmhouse design by BDR Fine Homes. Boasting over 4,300 SF and 4 bedroom suites plus a den, the home features a chef’s kitchen equipped with professional grade appliances and a large center island. The expansive covered outdoor room is designed for year-round living and entertaining, featuring heaters, a fireplace, TV, and BBQ. The flexible open-concept floor plan is tailored for today’s lifestyles, featuring a large great room that flows seamlessly into the kitchen and outdoor room. This state of the art home also features an electric vehicle charging station in the 3-car garage. The homes central West Bellevue location is situated blocks from downtown Bellevue and the nearby award winning schools. This luxury home will be completed in the Spring of 2018. Offered from the Low $400's! Introducing modern living at Brio! 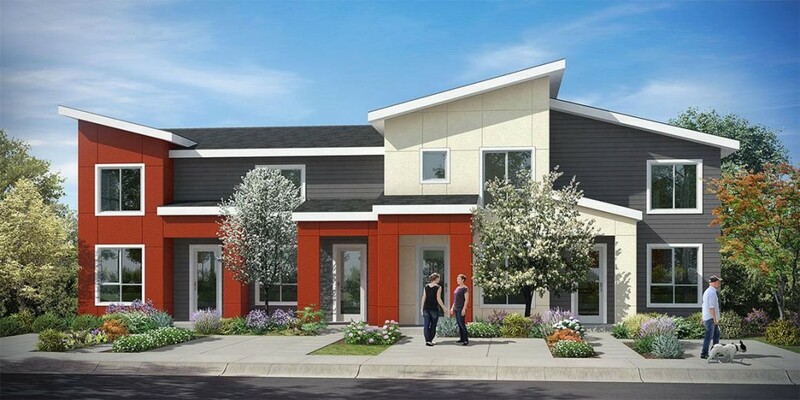 A new community comprised of 22 townhomes located in the master-planned Greenbridge neighborhood in southwestern Seattle. Offering between 1,334 and 1,803 SF, the Brio townhomes feature 2 & 3 bedroom designs, open-concept layouts, luxurious kitchens with large center islands, and signature covered outdoor rooms. Living is luxurious and convenient at Brio, as each townhome is appointed with over $50,000 in BDR Luxury Features. The new master-planned Greenbridge community is designed for the convenience of its residents, featuring an elementary school, Educare Early Learning Center, library, shops, and a cafe all located within steps of the Brio townhomes. The central location of Greenbridge also offers a quick connection to downtown Seattle. The BDR team has over 400 years of collective home building experiences and are the proud recipients of numerous national and regional awards for building excellence. Click to Learn More About BDR's New Brio Townhome Community! 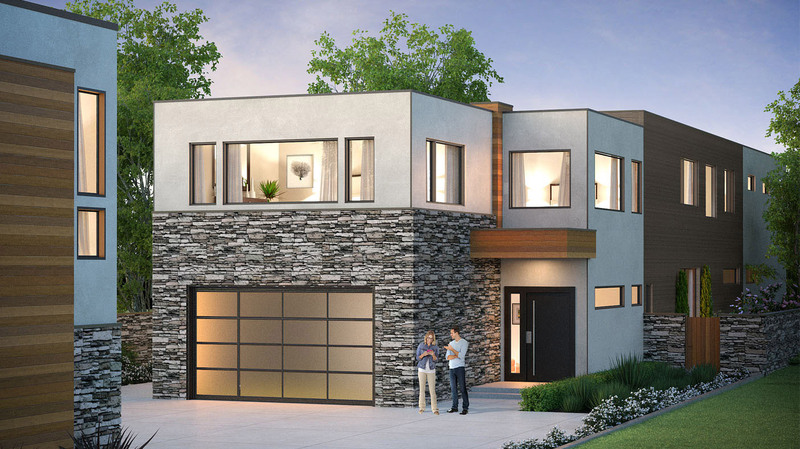 Discover the very finest in modern luxury living with this new design from BDR Fine Homes. Boasting over 6,100 SF and 5 bedroom suites plus a den, this new luxury home features a GenSuite guest suite with a separate kitchen, bedroom/living room, bathroom, and private entrance. The expansive covered outdoor living room is tailored for year-round living, featuring heaters, a fireplace, TV, and BBQ. The chef’s kitchen is equipped with top of the line appliances, luxurious finishes, custom cabinetry, and an oversized center island. The private master retreat features a large walk-in closet and a spa-like master bath. This home also features a unique detached flex space and garage spaces for 4 cars. The home resides in an ideal location in the heart of Medina, within walking distance to Medina Elementary, St. Thomas School, Overlake Country Club, Medina Park, and much more. This luxury home will be completed in the Winter of 2018. 3629 Courtland Pl. 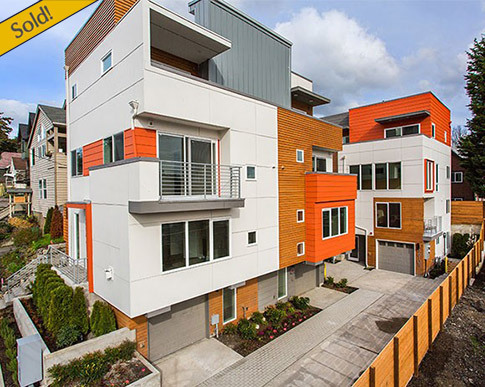 S, Seattle | Available From the Low $500's! You’re invited to come tour these spacious 2 & 3 bedroom townhomes that feature flexible open concept floor plans, gourmet kitchens with upgraded stainless steel appliances, and private master suites with large walk-in closets and luxurious master baths! Experience convenient modern living at the Reserve which is centrally located within walking distance to nearby shopping, dining, and the Mount Baker Light Rail Station. The close-in location also offers a quick connection to Downtown Seattle and Downtown Bellevue. Click Here to Learn More About the Cascade Townhome Collection at the Reserve! Homes from the Low $500's - Coming Summer 2017! Discover modern living at Capriccio, a new community comprised of 13 modern homes located in the master-planned Greenbridge neighborhood in southwestern Seattle. 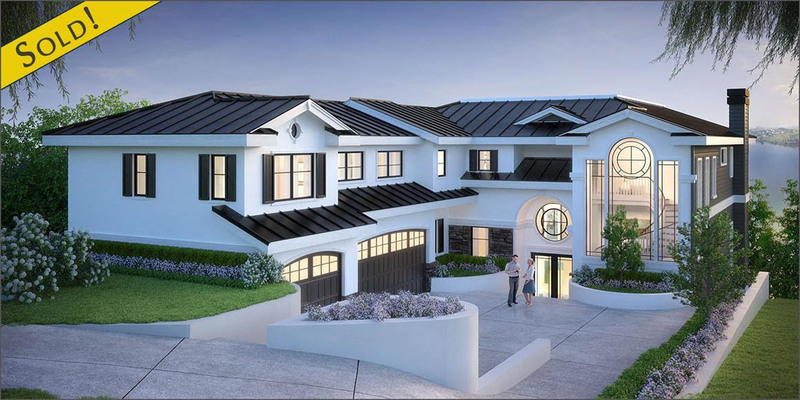 Offering between 2,067 and 2,729 SF, these fresh new modern homes feature 3 & 4 bedroom designs, open-concept layouts, luxurious kitchens with large center islands, incorporated technology, and covered outdoor rooms that are tailored for year-round entertaining. Living is luxurious and convenient in these modern homes that are appointed with over $50,000 in BDR Luxury Features. The new master-planned Greenbridge community is designed for the convenience of its residents, featuring an elementary school, Educare Early Learning Center, library, shops, and cafe all located within steps of the new Capriccio homes. The central location of Greenbridge also offers a quick connection to downtown Seattle. Located in the sought-after Lochleven neighborhood in West Bellevue, this fresh new farmhouse design by BDR Fine Homes boasts over 5,600 SF with 5 bedroom suites plus a den. From the chef’s kitchen equipped with professional grade appliances and a large center island, to the separate prep-kitchen and large bonus room, this new offering from BDR Fine Homes is designed for the very finest in luxury living. The expansive covered outdoor room is tailored for year-round entertaining and living; featuring heaters, a fireplace, TV, and BBQ. This home is centrally located within a few blocks from downtown Bellevue, Bellevue Square, the Meydenbauer waterfront park, and the charming shops and restaurants of Old Bellevue on Main Street. This location also offers a quick connection to the nearby award winning Bellevue schools. Introducing 2 new modern townhomes located in the coveted East of Market neighborhood, just steps from vibrant downtown Kirkland. The townhomes feature 2,787 SF, 3 bedrooms plus an office, and chef’s kitchens equipped with high-end appliances. The expansive private roof-top decks are the perfect place to entertain, with views and inviting stone fireplaces. Living is luxurious in these new townhomes that are appointed with over $100,000 in “BDR Luxury Features”. The central location is situated minutes from the Google campus, Microsoft Campus, and Downtown Bellevue. With parks, shopping, the Kirkland waterfront, and renowned restaurants at your doorstep, these new townhomes offer the very finest in Kirkland living! 221 24th Ave East, Seattle | Offered from the High $500's! 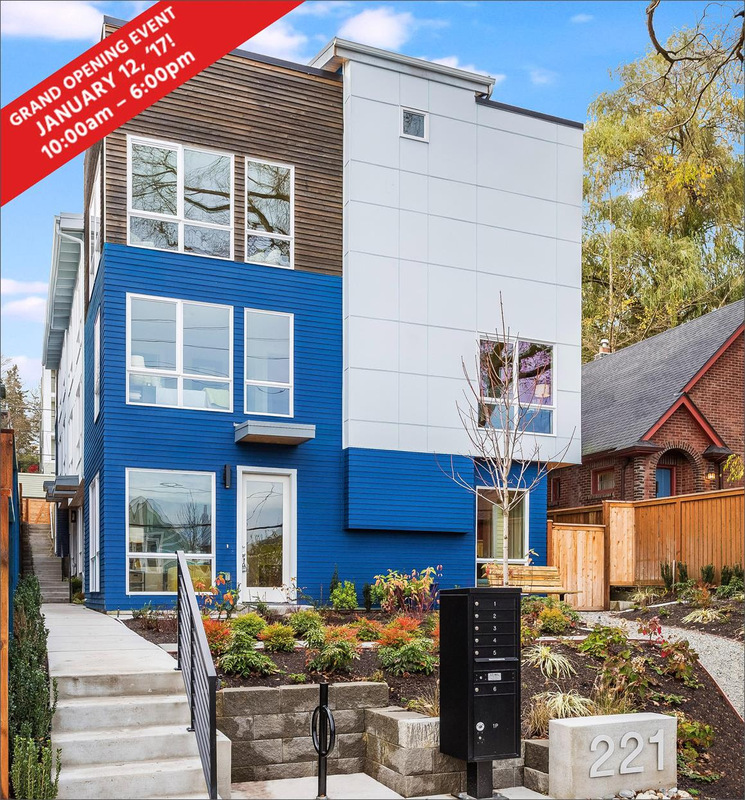 You’re invited to come tour the newly completed Capitol Hill modern townhomes Thursday, January 12th from 10am – 6pm. Come and enjoy local catering provided by La Spiga restaurant! Step into modern luxury living in these bright and airy new townhomes that feature oversized windows for abundant natural light, vaulted ceilings, and flexible open concept floor plans. The 2 & 3 bedroom homes feature gourmet kitchens with upgraded stainless steel appliances, private master suites with large walk-in closets and luxurious master baths, and stylish quartz counters and Grohe fixtures throughout. 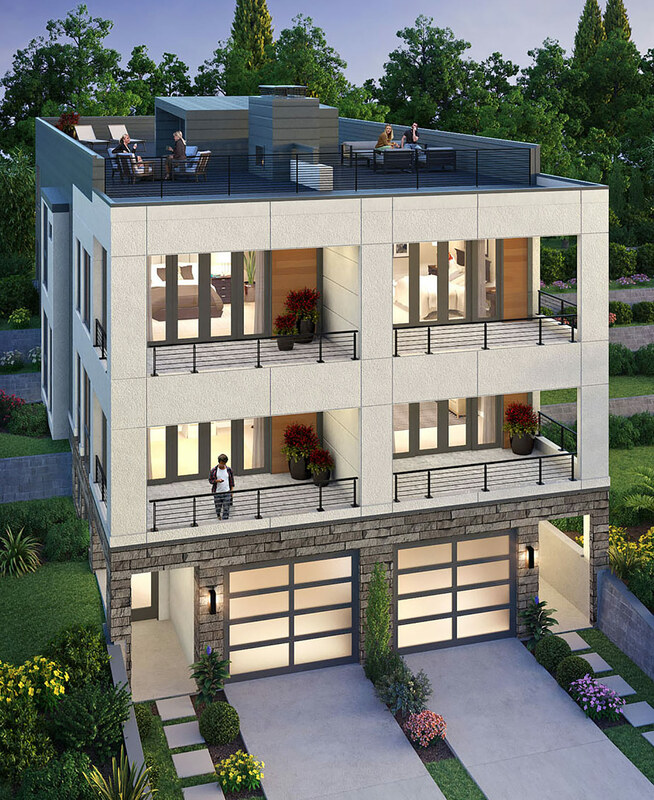 The 3 bedroom homes feature private roof-top decks, perfect for entertaining! Live an active Seattle lifestyle at this new community, centrally located within walking distance to the renowned entertainment, dining, and recreation that the Capitol Hill and Madison Valley neighborhoods are known for. The close-in location offers a quick connection to Downtown Seattle and Downtown Bellevue. You’re invited to tour the newly completed “Timeless in Seattle” Windermere luxury home crafted by BDR Homes on Wednesday, January 11th from 10am – 6pm. Come enjoy local catering provided by Piatti Italian restaurant! Situated in the coveted Windermere neighborhood, this classic four square style home features a charming wrap-around covered front porch and utilizes four sided architecture to take advantage of the corner lot it sits upon. The home features 4 bedrooms with 4.5 baths and offers 3,820 square feet of luxurious living space. The chef’s kitchen is equipped with professional grade appliances and features a large center island and a separate prep kitchen. The signature covered outdoor room is the perfect place to entertain, featuring heaters, a fireplace, & TV. Discover the convenience and charm of one of Seattle’s most treasured neighborhoods. Situated with close proximity to Children’s Hospital, University Village, and the University of Washington, the Windermere neighborhood offers a quick connection to downtown Seattle and is located just blocks from Magnuson Park and the renowned Sand Point Country Club. Introducing the BDR Homes 2017 Kirkland luxury collection. 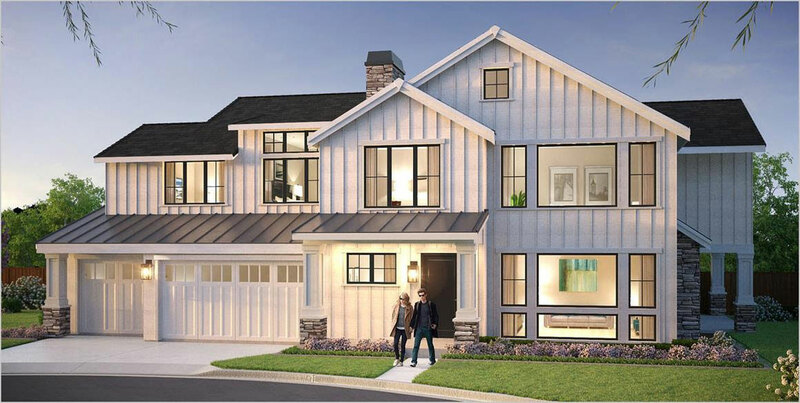 Located in Kirkland’s most treasured neighborhoods, the collection features innovative modern and charming classic home designs with signature covered outdoor living rooms, chef’s kitchens with professional grade appliances, and open-concept floor plans. The central locations offer a quick connection to the Google and Microsoft campuses. 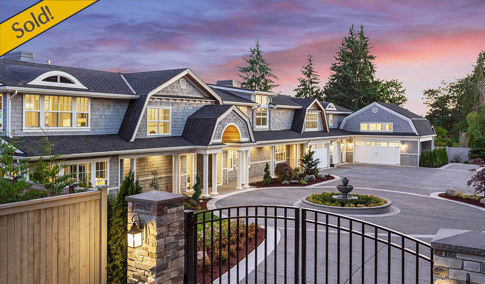 These fresh new designs from BDR Homes offer the very finest in Kirkland luxury living! 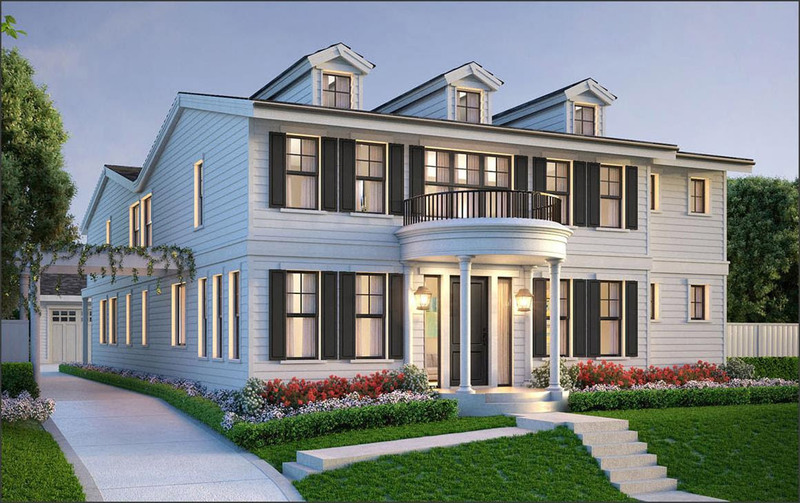 Introducing a fresh new timeless luxury home centrally located in Kirkland’s Forbes Creek neighborhood. Offering over 3,500 SF with 4 bedrooms and 3.25 baths, this home features a signature covered outdoor room complete with heaters, a fireplace, and TV. From the elegant kitchen equipped with professional grade appliances and a 10′ center island, to the large great room and bonus room, this new offering from BDR Homes is designed for the very finest in modern luxury living. This home is also appointed with over $100,000 in BDR Luxury Features. Nestled on a quiet, large, and bright lot, this home is located only a short drive from the distinguished restaurants and shopping in the Downtown Kirkland waterfront district. The central location also offers a quick connection to the nearby Google & Microsoft campuses. This luxury home will be completed in the Spring of ’17, please contact us for more information on this exciting opportunity! 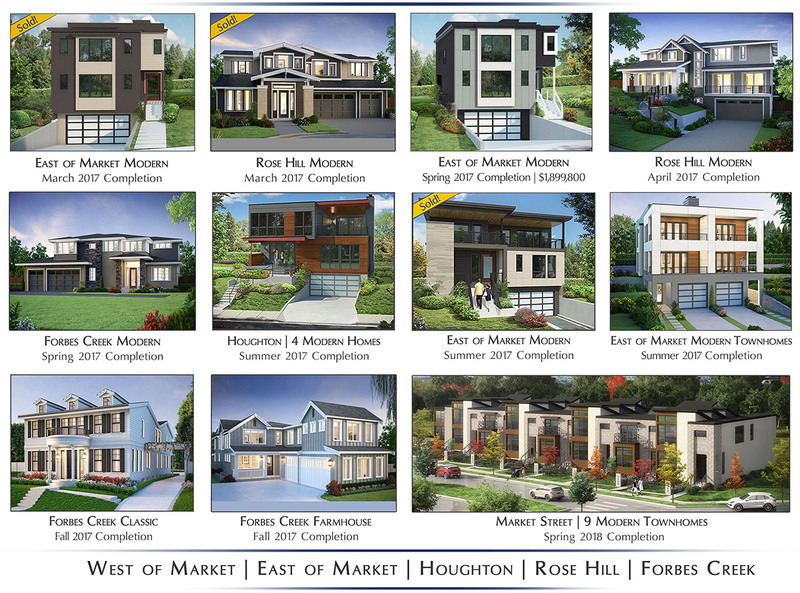 Introducing the BDR Homes 2017 Collection of new homes and townhomes situated in Seattle’s most desirable neighborhoods. The Collection features creative modern and charming classic home designs built for today’s lifestyles. 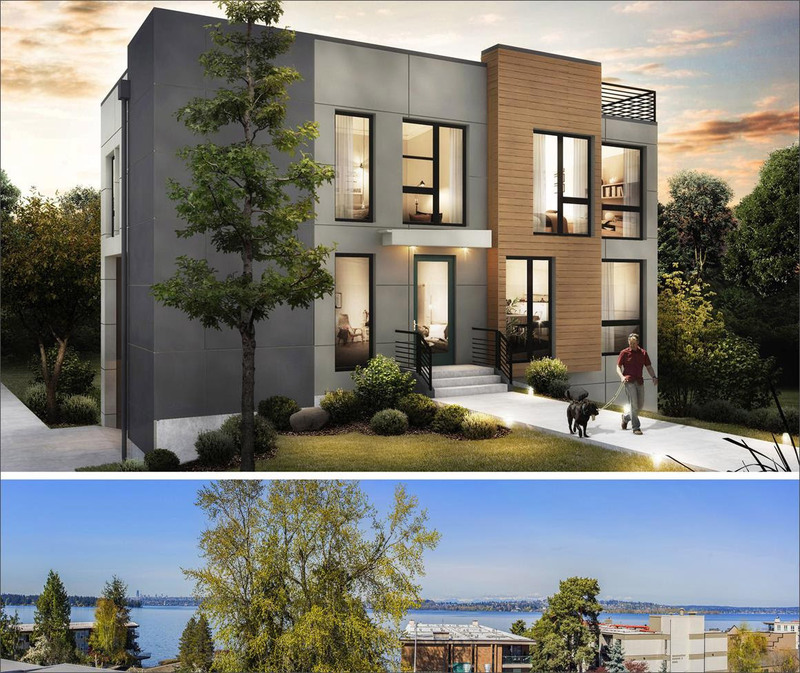 From the signature covered outdoor living rooms, to the chef’s kitchens with upgraded appliances, the new BDR Homes Seattle Collection offers the very finest in modern living. The central locations, many adjacent to transit-hubs and light-rail stations, offer a quick connection to Downtown Seattle. BDR Homes was honored with 4 home design awards at the 2016 New Home Council Tribute Awards. 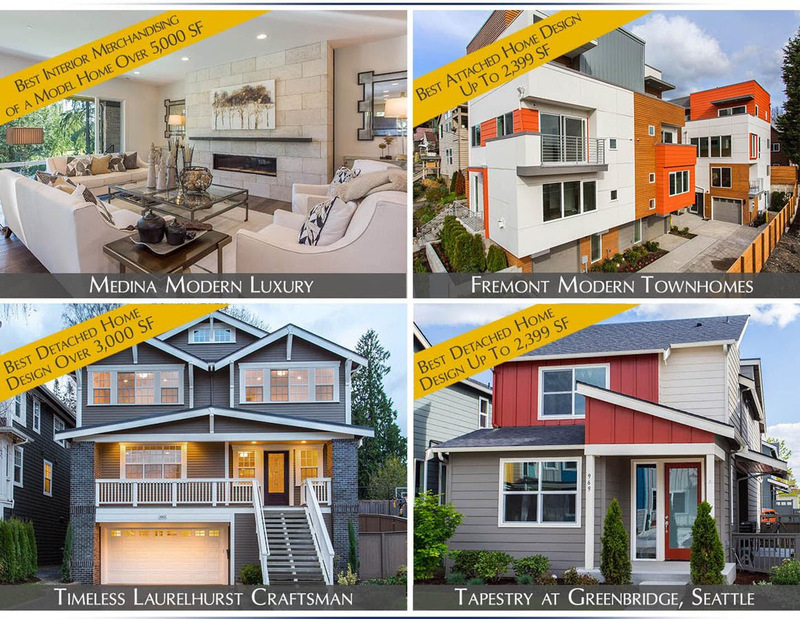 The Tribute Awards recognize excellence in new home design, staging, marketing, and sales in the Greater Seattle area. 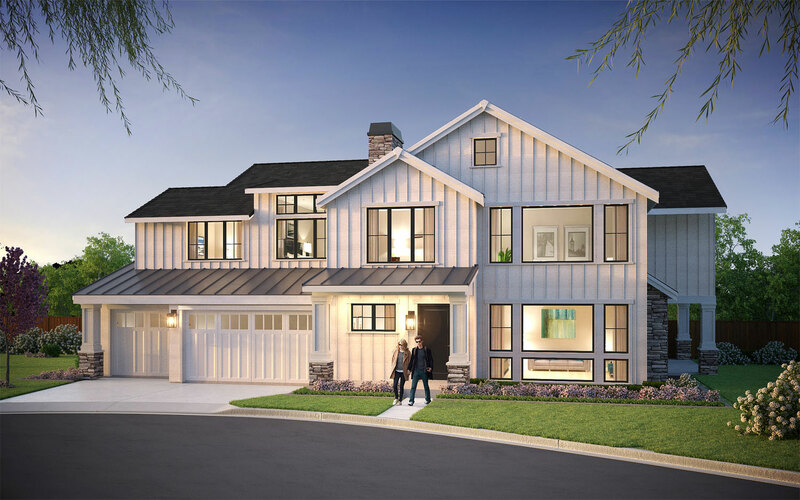 The Medina Modern Luxury Home on Overlake Golf Course was awarded for Best Merchandising of a Model Home Over 5,000 SF and the Fremont Modern Townhomes was named the Best Attached Home Design up to 2,399 SF. 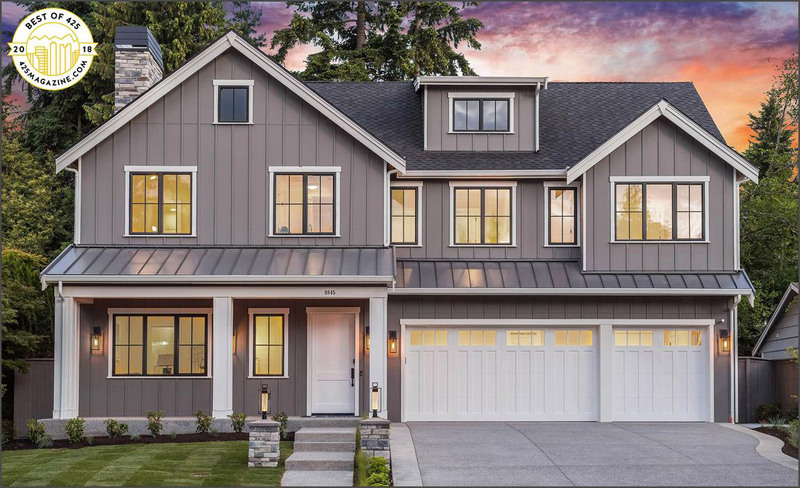 The fresh new home designs at Tapestry in Greenbridge, Seattle won the Best Detached Home Design up to 2,399 SF and the Timeless Laurelhurst Craftsman luxury home was awarded the Best Detached Home Design Over 3,000 SF! Introducing the BDR Fine Homes 2017 luxury home collection. Located in the areas most sought after neighborhoods, the homes feature signature covered outdoor living rooms, chef’s kitchens with professional grade appliances, spa-like master baths and range in size from 4,300 to over 9,100 square feet. These fresh new designs from BDR Fine Homes offer the very finest in luxury living! Introducing a fresh new modern design on Clyde Hill. This new luxury home boasts over 6,000 SF with 5 bedroom suites plus a den. The chef’s kitchen is equipped with professional grade appliances and features a large 10’ island and a separate prep kitchen. The expansive covered outdoor room is designed for year-round entertaining, featuring heaters, a fireplace, TV, and BBQ. Additional features include a large media room, an inviting wine grotto, and an exercise room. This new luxury home sits atop Clyde Hill, one of the most sought after communities on the West Coast. The award winning elementary and middle schools are a few blocks away, while the central location offers a quick connection to downtown Bellevue, Kirkland, and Seattle. This luxury home will be completed in April 2018. Todd R. Bennett, Principal and Founder of BDR Holdings LLC, announces Richard Obernesser as President, with primary responsibility for the Company’s expanding BDR Housing Group of Companies. In his role as President, Mr. Obernesser will oversee diversified holdings of Puget Sound area companies focused on construction of residential communities located near job centers and/or transit hubs. The Company’s Seattle Division builds townhome and single-family home projects throughout the city. The company’s Kirkland Division builds modern and transitional style homes centrally located near downtown Kirkland. 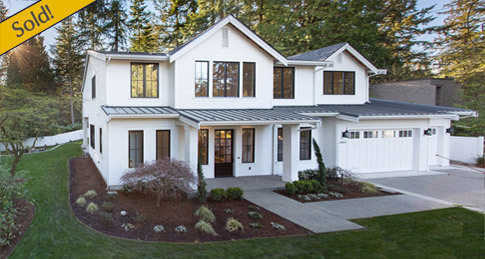 The company’s Fine Homes Division builds high-end luxury homes of creative style in West Bellevue and Mercer Island. The Company also has a Custom Home Division working on projects throughout the Seattle region. Overall, the BDR Housing Group is one of the largest “in fill” builders of residential communities in the greater Seattle area. Under Mr. Obernesser’s leadership, the BDR Housing Group plans to increase housing choices with a goal of enhancing the Company’s posture as a leading homebuilder in the market place. Mr. Obernesser has extensive experience in high-level management of home building companies on a national level serving as President of Shea Homes Seattle office for 14 years with primary responsibility for building over 2000 homes. In addition, Mr. Obernesser held executive management positions with national homebuilder Pulte Homes and is a certified Executive Coach. Richard and his wife Karla live in Bellevue and are the parents of four great people. Paul Glosniak who has served as President of BDR Homes for the past 6 years is selling his interest in the Company and is stepping down to pursue other business interests. Mr. Glosniak will continue to provide service to BDR as an advisor. Located in the sought-after Lochleven neighborhood in West Bellevue, this fresh new Traditional design by BDR Fine Homes boasts 5,594 SF including 5 bedroom suites plus a den. The expansive covered outdoor room is designed for year-round entertaining; featuring heaters, a fireplace, TV, and BBQ. The GenSuite guest suite features a full-kitchen, bathroom, and bed/living room; all accessible through a private entrance. From the chef’s kitchen equipped with professional grade appliances and an oversized 10′ island, to the separate prep-kitchen, this new offering from BDR Fine Homes is designed for the very finest in luxury living. This home is centrally located within a few blocks from downtown Bellevue, Bellevue Square, the expansive Meydenbauer waterfront park, and the charming shops and restaurants of Old Bellevue on Main Street. This luxury home will be completed in Spring 2019. Join us for a new-construction Grand Opening event Thursday, August 18th at The Reserve at Mount Baker, a new community of modern single family homes and townhomes centrally located near the new Mount Baker Light Rail station. These new homes offer 1,376 SF – 1,507 SF, 3 bedrooms with 2 baths, and feature chef’s kitchens and flexible open concept layouts. Come and enjoy gourmet snacks and refreshments provided by Bis on Main. The Reserve at Mount Baker resides in the heart of the growing Mount Baker community, adjacent to a new shopping center and within walking distance to the new Mount Baker Light Rail station. Downtown Seattle is just a short drive or ride away. The BDR team has over 400 years of collective home building experiences and its members are the proud recipients of numerous national and regional awards for building excellence. Join us for an exclusive new-construction Grand Opening event in Medina Thursday, August 18th. Tour BDR Fine Homes newly completed luxury home situated on Overlake Golf Course while enjoying hors d’oeuvres provided by Bis on Main and gourmet treats by Lady Yum. Valet parking will also be provided. This fresh new luxury home boasts over 7,700 SF with 5 bedroom suites plus a den and features 100′ of golf course frontage, a 5 car garage, a detached signature Gensuite guest suite, and an expansive covered outdoor living room complete with heaters, a fireplace, TV, and BBQ. The chef’s kitchen is equipped with professional grade appliances and features a 12′ island and a separate prep-kitchen. Additional luxury features include a wine-grotto, exercise room, and an expansive recreation room complete with a kitchen. The home is situated minutes from the community’s award winning schools and offers a quick connection to downtown Bellevue, Kirkland, & Seattle. The Overlake Country Club offers an extensive program of golf, social, tennis, and swimming activities with an emphasis on camaraderie and family. This newly completed luxury home is being offered for $7.2M. BDR Fine Homes presents a once in a lifetime opportunity to own an impressive private Dutch Colonial estate in the heart of Clyde Hill. Situated on a large 30K SF level lot, this new luxury home features a private gated entry leading to a circular drive with a beautiful focal fountain. The home boasts over 9,100 SF, 6 bedroom suites plus a den, and features a 5 car garage with generous parking. The chef’s kitchen is equipped with professional grade appliances and features 2 separate cooking and entertainment islands. The expansive covered outdoor living room is designed for year-round entertaining; including heaters, a fireplace, TV, and an outdoor kitchen. The signature Gensuite guest suite features a full kitchen, living room, bedroom, and bathroom, all accessible through a private entrance. This luxury home is situated in the heart of the coveted Clyde Hill community, conveniently located within walking distance to Tully’s Coffee. The award winning schools are a short drive away and the areas many community parks are located nearby. The central location offers a quick connection to downtown Seattle, Redmond, & Bellevue. This legacy luxury estate will be completed in December of 2016. Introducing 3 fresh new timeless homes centrally located in Rose Hill near downtown Kirkland. The homes feature 4 bedroom open-concept floor plans, ranging from 3,520 to 3,628 SF, and include chef’s kitchens equipped with professional grade appliances and large center islands and signature covered outdoor living rooms designed for year-round entertaining, each featuring a stone fireplace, TV, & heaters. The homes are also luxuriously appointed with over $100,000 in BDR Luxury Features. Situated steps from the local top rated schools and located less than 5 minutes from the Google Campus, these new homes offer the very finest in close-in Kirkland luxury living. 1307 88th Pl NE, Clyde Hill | $4.7M – Presold! This new luxury home by BDR Fine Homes boasts 6,019SF with 4 bedroom suites plus a den, an oversized 3 garage, and an expansive outdoor living room designed for year-round entertaining; featuring heaters, a fireplace, TV, and a BBQ. The chef’s kitchen is equipped with professional grade appliances and features an expansive 10′ kitchen island and a separate prep kitchen. The lower floor features an impressive recreation room complete with a full-size bar. Situated on a large and bright corner lot, this new home resides in the heart of one of the areas top neighborhoods, with a quick connection to the nearby award winning schools and downtown Bellevue. This pre-sold home will be completed in March 2017. Fresh New Designs Located Steps from Houghton Beach & Carillon Pt. 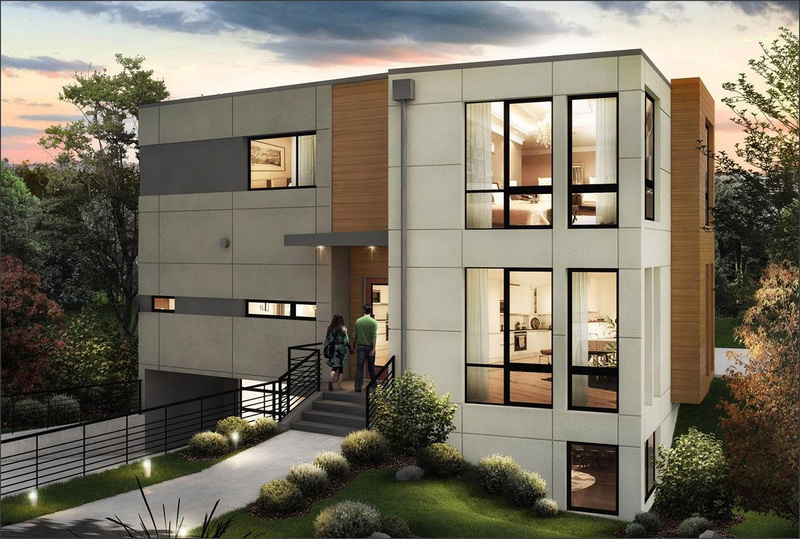 Introducing 4 fresh new modern homes centrally located near downtown Kirkland. Situated steps from the Lake Washington waterfront and Carillon Point, these new modern homes offer the very finest in Kirkland luxury living. The homes feature 3 & 4 bedroom layouts, ranging from 2,814 to 4,218 SF, featuring chef’s kitchens equipped with professional grade appliances and large center islands. The covered outdoor living rooms are perfect for year-round entertaining. The homes are also luxuriously appointed with over $100,000 in BDR Luxury Features. 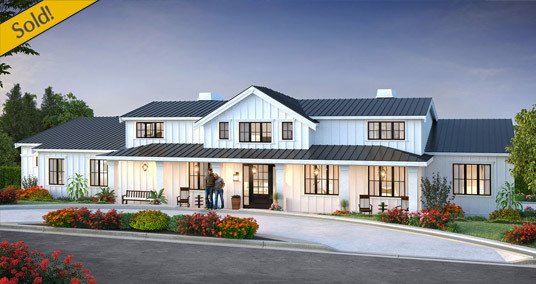 Introducing a fresh new Farmhouse design by BDR Fine Homes located in the sought after Enatai neighborhood. This new luxury home boasts over 5,400 SF and features 5 bedroom suites plus a den. The expansive covered outdoor room is designed for year-round entertaining; featuring heaters, a fireplace, TV, and BBQ. The flexible open-concept layout is tailored for today’s modern lifestyles. The signature Gensuite guest suite features a full kitchen, bathroom, bedroom, and living room; all accessible through a private entrance. This luxury home is located within walking distance to Enatai Elementary, numerous neighborhood parks and tennis-courts, and is minutes away from downtown Bellevue. Located on a quiet, large, and bright lot, this fresh new design blends exquisite craftsmanship with practical livability. From the chef’s kitchen equipped with top of the line appliances and an expansive 12′ kitchen island, to the separate prep kitchen and mudroom, this new offering from BDR Fine Homes offers the very finest in luxury living. This home is being offered for $3,798,800 and will be completed in February 2017. 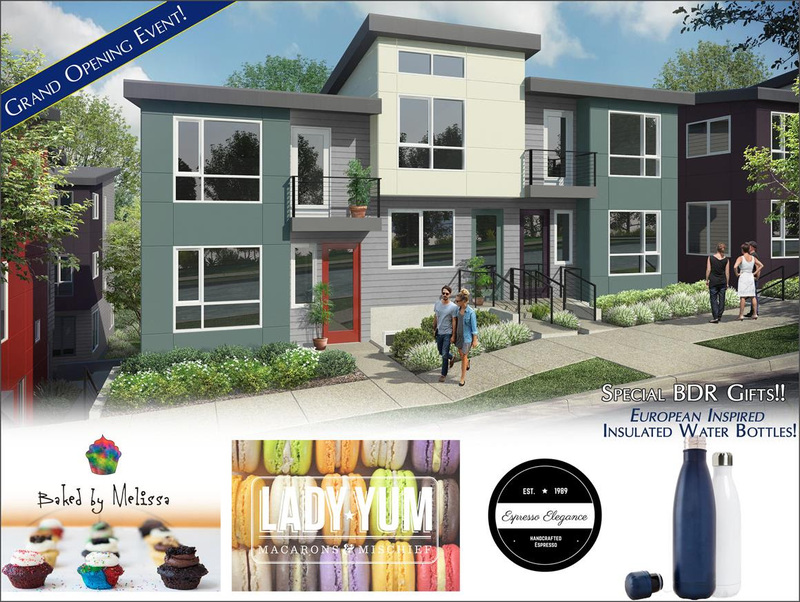 Join us for a new-construction Grand Opening event this Thursday at Tapestry in the new masterplanned Greenbridge neighborhood in southwestern Seattle. 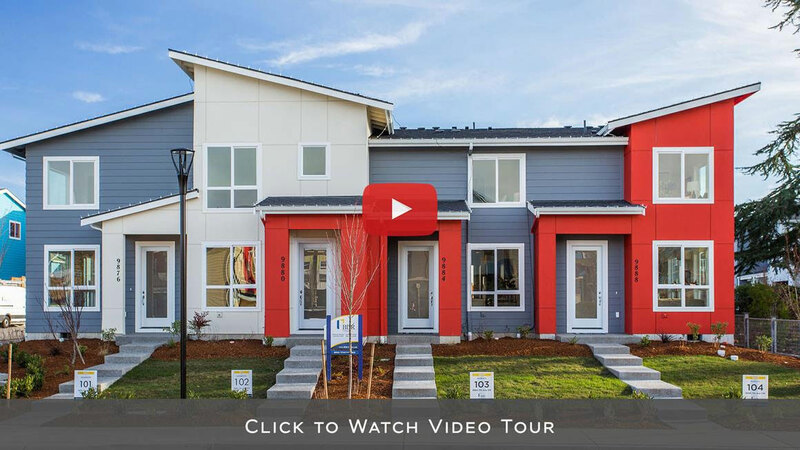 Tour BDR Homes newly completed modern home that offers over 2,500 SF, 4 bedrooms and 3.5 baths, and features a chef’s kitchen, flexible open concept layout, and a large covered outdoor room. Come and enjoy food and refreshments provided by Greenbridge Cafe from 11am – 2pm. Tapestry resides in the heart of the new Greenbridge community, featuring an elementary school, an Educare Early Learning Center, a library, shops, and cafe’s, all located within steps of the Tapestry homes. The central location of Greenbridge also allows for a quick connection to downtown Seattle. The Tapestry community is over 85% sold-out, secure your new modern home today! Discover modern living at Tessera, a new community comprised of 24 modern townhomes located in the masterplanned Greenbridge neighborhood in southwestern Seattle. 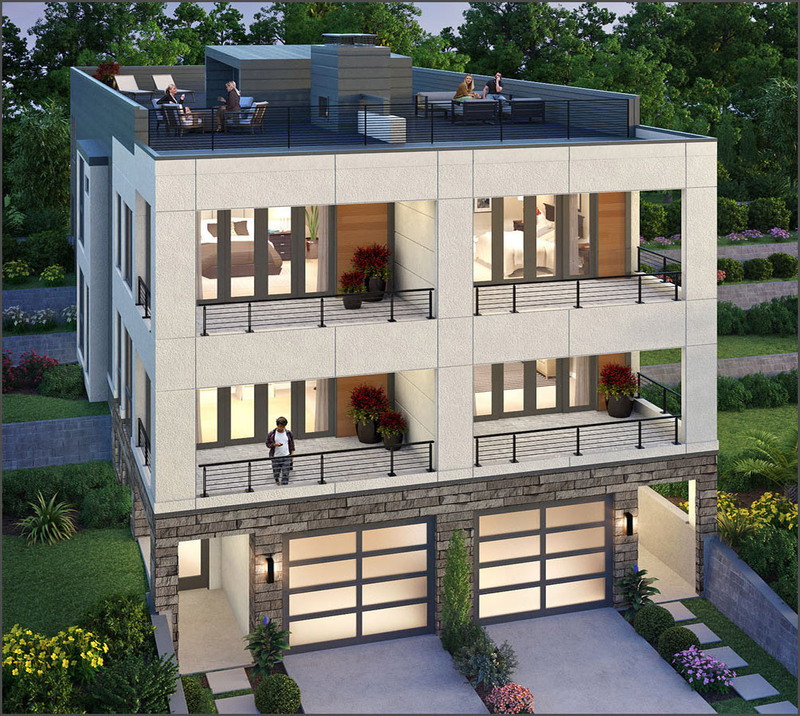 Offering between 1,700 and 2,200 SF, these fresh new modern townhomes feature 3 & 4 bedroom layouts, open-concept designs, luxurious kitchens with large center islands, incorporated technology, and covered outdoor rooms that are tailored for year-round entertaining. Living is luxurious and convenient in these modern townhomes that are appointed with over $50,000 in “BDR Luxury Features”. The new masterplanned Greenbridge community is designed for the convenience of its residents, featuring an elementary school, an Educare Early Learning Center, a library, shops, and cafe’s, all located within steps of the Tessera townhomes. The central location of Greenbridge also allows for a quick connection to downtown Seattle. Introducing a fresh new Dutch Colonial design located on the fabulous west side of Yarrow Point. 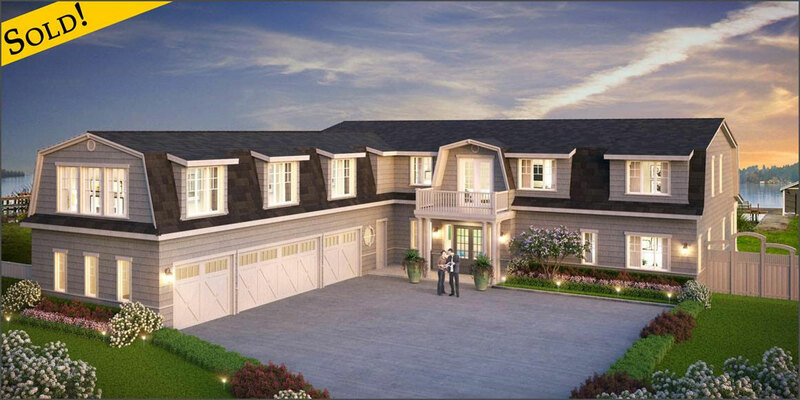 This new luxury home boasts over 6,800 SF and 5 bedroom suites plus a den. The expansive signature outdoor room is designed for year-round entertaining and living; featuring heaters, a fireplace, and TV. The chef’s kitchen is equipped with professional grade appliances and features a 12′ kitchen island and a separate prep kitchen. Additional luxury features include an exercise room, wine grotto, and an inviting morning room. The Gensuite guest suite features a full kitchen, living room/bedroom, and bathroom. This luxury home is situated in the heart of the sought after Yarrow Point community, residing on a large, sunny, western facing lot with mature landscaping. The BDR Team has over 400 years of collective home building experiences and are the proud recipients of numerous national and regional awards for building excellence. This luxury home is being offered for $5,498,800 and will be completed in March 2017. 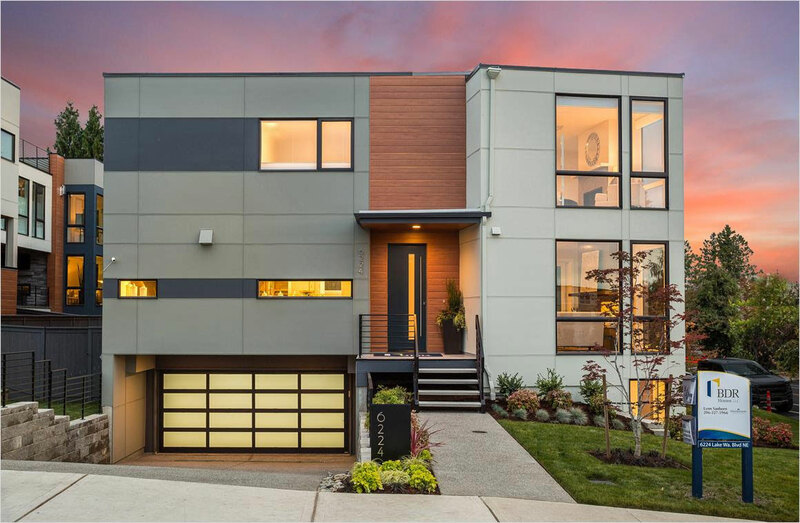 BDR Homes presents a fresh new modern design in the coveted East of Market neighborhood in Kirkland. Tour this newly completed modern luxury home this Wednesday April 20th, while enjoying contemporary Italian cuisine and beverages provided by the renowned Volterra restaurant. This new luxury home features a flat and private backyard, 4 bedrooms plus a den, and a large covered outdoor room complete with heaters, a fireplace, and TV. The chef’s kitchen features top of the line appliances, a 10′ center island, and a separate prep-kitchen. Walk to Kirkland’s vibrant downtown district, offering renowned dining, entertainment, and recreation. Join us for an exclusive new-construction Grand Opening event in Beaux Arts this Thursday, March 31st from 10:00am – 6:00pm at 2807 107th Ave SE. Tour BDR Fine Homes newly completed luxury home while enjoying hors d’oeuvres provided by Bis on Main and gourmet treats by Lady Yum. Valet parking will also be provided. This fresh new luxury home boasts over 4,500 Sq. Ft. and features 4 bedroom suites plus a den. The private Beaux Arts community offers over 1,100′ of western facing waterfront on the shores of Lake Washington, including deep water moorage, a swimming pier with lifeguard, playground, tennis-courts, fire-pits, and a boat launch. This home features an expansive outdoor room that is designed for year-round entertaining, featuring heaters, a fireplace, TV, and BBQ. The chef’s kitchen features professional grade appliances and a large 10′ kitchen island. This newly completed luxury home is being offered for $2,989,800. 3845 95th Avenue NE, Yarrow Point | $4.0M - Presold! Introducing a fresh new Farmhouse design on Yarrow Point. Situated on a large eastern-facing lot, this new luxury home boasts over 5,400SF with 5 bedroom suites plus a den, an oversized 3 garage, and an expansive outdoor living room designed for year-round entertaining; featuring heaters, a fireplace, TV, and a BBQ. The chef’s kitchen is equipped with professional grade appliances and features an expansive 10′ kitchen island and a separate prep kitchen. The signature GenSuite guest suite features a full kitchen, living/bedroom, and bathroom, all accessible through a private entrance. This luxury home is situated in the heart of the sought after Yarrow Point community. Residing on a large, private, and flat lot, this new luxury home offers the very finest in convenient living in one of the areas top neighborhoods. The award winning schools are a short drive away and the location offers a quick connection to downtown Bellevue, Redmond, and Kirkland. This luxury home has been presold and will be completed in November of 2016. 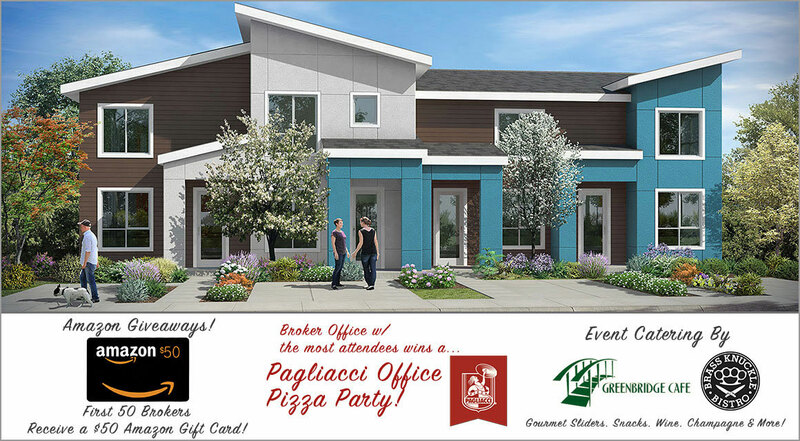 Join us for an exclusive new-construction Grand Opening event in Fremont this Wednesday March 9th from 11:00am – 6:00pm. Tour BDR Homes newly completed modern townhomes while enjoying organic cuisine provided by the renowned Tilth restaurant, a Chef Maria Hines restaurant. These new townhomes feature flexible open-concept floor plans ranging in size from 1,281SF to 1,656SF, featuring 2 & 3 bedrooms. Enjoy the central Fremont location situated steps from bustling nightlife and entertainment, cafes, and shopping, while downtown Seattle and the central business district are just 10 minutes away. 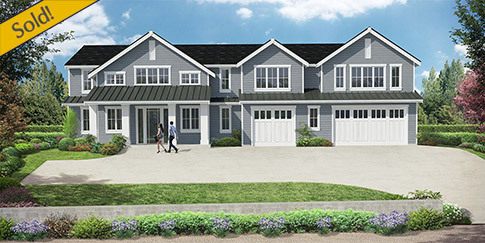 BDR Homes announces the start of construction of phase II of the successful Tapestry modern homes project in the new Greenbridge master-planned community in southwestern Seattle. Phase I of Tapestry was a sales success, with all of the homes having sold prior to completion. Phase II of the Tapestry homes community features fresh new modern home designs complete with outdoor living spaces and flexible open-concept floor plans. The homes offer over 2,500SF with 4 bedrooms and 3.5 baths and are luxuriously appointed with over $50,000 in BDR Luxury Features.. 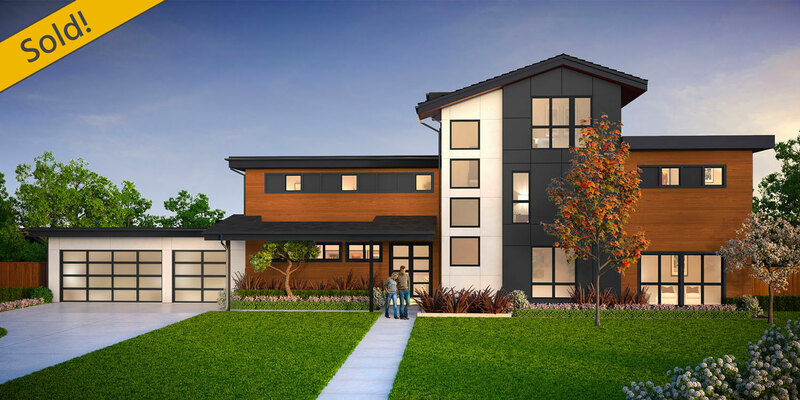 Discover these fresh new modern homes located in the coveted East of Market neighborhood. With parks, shopping, the Kirkland waterfront, and renowned restaurants a few blocks away, these luxury homes offer the very finest in convenient modern living. The homes offer 3 and 4 bedrooms layouts, with 2,946 and 3,742 square feet, and feature covered outdoor living rooms complete with heaters, a fireplace, and TV. The homes are also luxuriously appointed with over $100,000 in BDR Luxury Features. Enjoy the central location situated just minutes from Google’s Kirkland campus, the Microsoft Redmond Campus, and Downtown Bellevue. These modern luxury homes will be completed in the Summer of 2016. 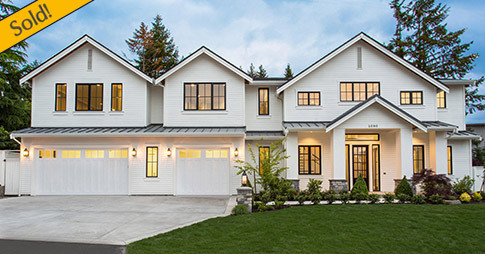 Introducing a fresh new craftsman home design in the heart of Seattle’s coveted Windermere neighborhood. Boasting over 3,800 square feet with 4 bedrooms plus a den, this new luxury home features a large covered outdoor living room that is designed for year-round entertaining and a chef’s kitchen that is equipped with top of the line appliances and a large kitchen island. Discover the convenience and charm of living in one of Seattle’s most treasured neighborhoods. Situated with close proximity to Children’s Hospital, University Village, and the University of Washington, the Windermere neighborhood offers a quick connection to downtown Seattle and is located just blocks from Magnuson Park and the renowned Sand Point Country Club. 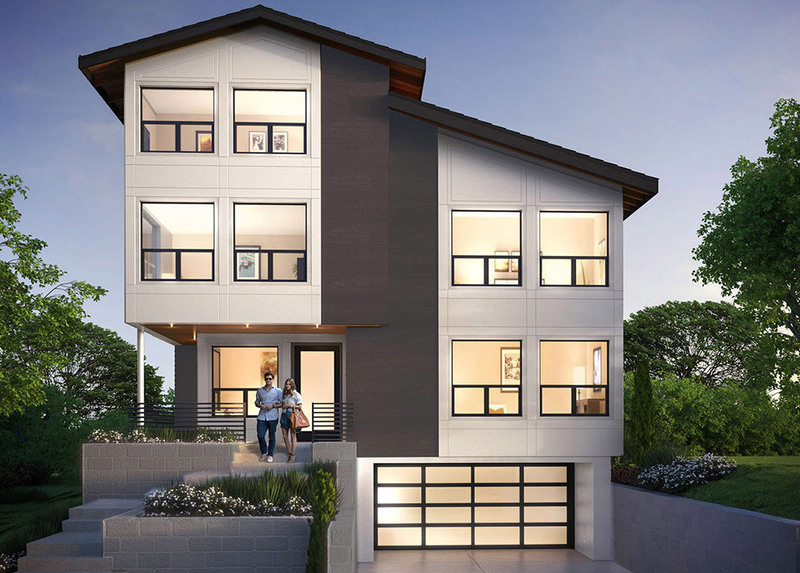 Join us for an exclusive new-construction Grand Opening event on Yarrow Point this Thursday December 3rd from 10:00am – 6:00pm at 3823 94th Ave NE. Tour BDR Fine Homes newly completed luxury home while enjoying hors d’oeuvres provided by Bis on Main and gourmet treats by Lady Yum. Located in the heart of the exclusive Yarrow Point community, this fresh new luxury home boasts over 5,100 Sq. Ft. and 5 bedroom suites plus a den. The expansive signature outdoor room is designed for year-round entertaining, featuring heaters, a fireplace, TV, and BBQ. The chef’s kitchen features professional grade appliances and a large 10′ kitchen island. Ideally suited for large families, this home also features a signature GenSuite guest-suite, offering a full kitchen, bed/living room, and bathroom, accessible through a private entrance. Presented by Art Whittlesey & Kitty Ballard of Windermere Real Estate, this new luxury home is being offered at $3,289,800. 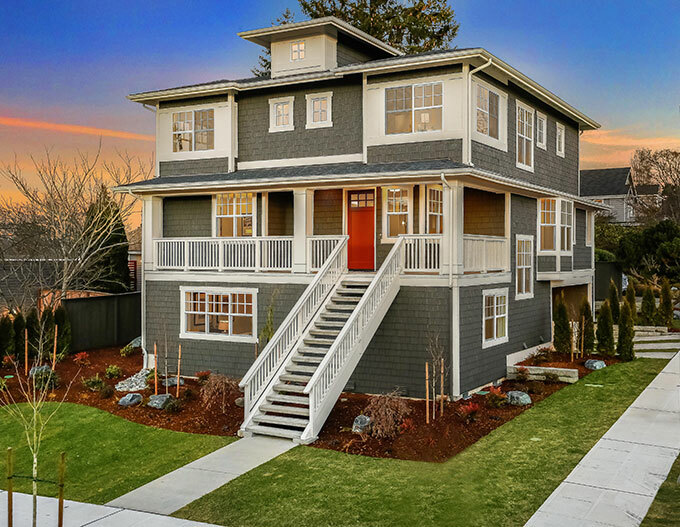 Discover these fresh new modern homes in the coveted East of Market neighborhood, situated just steps from downtown Kirkland. These new luxury homes feature over 3,500SF and 4 bedrooms plus a den. The large covered outdoor rooms are designed for year-round living, featuring heaters, a fireplace, and TV. The expansive roof-top decks are the perfect place for fair-weather entertaining. Living is luxurious and convenient in these modern homes that are appointed with over $50,000 in “BDR Luxury Features”. The renowned dining and shopping of downtown Kirkland is at your doorstep. Enjoy the close proximity to the expanding Google Campus and Microsoft Redmond Campus, while numerous parks and the popular Kirkland waterfront are just a short stroll away. Located in the renowned Enatai neighborhood in Bellevue, this fresh new Colonial design offers over 5,890SF with 6 bedroom suites plus a den. The expansive covered outdoor room is designed for year-round entertaining; featuring heaters, a fireplace, TV, and BBQ. The GenSuite guest suite features a full-kitchen, bathroom, and bed/living room; all accessible through a private entrance. This luxury home resides on an expansive corner lot, is located within walking distance to the new Enatai Elementary School (completion in 2016), and is minutes away from downtown Bellevue. From the chef’s kitchen equipped with top of the line appliances and a large 10 foot kitchen island, to the separate prep kitchen, this new offering from BDR Fine Homes is the epitome of luxury living. Discover these fresh new modern homes in the East of Market neighborhood, situated just steps from vibrant downtown Kirkland. These new luxury homes offer over 3,500SF and 4 bedrooms plus a den. The large covered outdoor rooms are designed for year-round entertaining, featuring heaters, a fireplace, and TV. Living is comfortable and convenient in these modern homes that are appointed with over $100,000 in “BDR Luxury Features”. The renowned dining and shopping of downtown Kirkland is at your doorstep. Enjoy the close proximity to the Google Campus and Microsoft Redmond Campus, while numerous parks and the Kirkland waterfront are just a short stroll away. 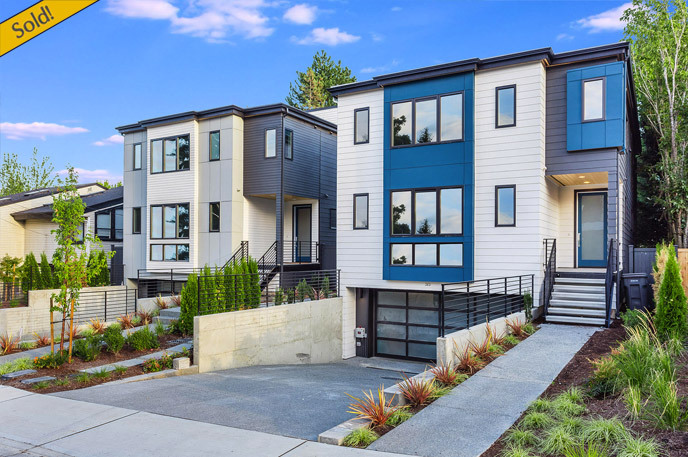 Living is comfortable and convenient in these new modern townhomes centrally located in the heart of the vibrant Mount Baker neighborhood in Seattle. Luxuriously appointed with over $30,000 in upgraded features, these fresh new designs offer spacious 2 & 3 bedroom layouts with 2 full baths, granite countertops, and upgraded appliances. This new community is ideally located within walking distance to a new shopping center and quaint local restaurants and cafes. A new light rail station is located nearby, so downtown Seattle is only a short ride away. Please contact us today for more information on this outstanding new opportunity. You’re invited to come tour BDR Homes newly completed modern homes in the heart of downtown Issaquah, while enjoying hors d’oeuvres and beverages provided by Issaquah’s own Chinoise Sushi Bar & Asian Grill. Come meet Chef Thoa Nguyen who will be on site for the event. Situated just steps from charming Front Street in downtown Issaquah, these fresh new homes boast over 2,500 Sq. Ft. with 4 bedrooms and 3.5 baths. Luxuriously appointed with over $50,000 in upgraded features, these homes offer caesarstone slab counter-tops, stainless steel appliances, and large kitchen islands. The covered outdoor patios are the perfect place to entertain or relax. The central Issaquah location allows for quick-and-easy access to the employment centers of downtown Bellevue & Seattle, while being surrounded by the recreation and shopping that Issaquah is renowned for. Presented by Mark Winningham of Teambuilder Keller Williams, these modern homes are being offered in the low $800’s. Join us for an exclusive new-construction Grand Opening event on Yarrow Point next Thursday August 6th from 10:00am – 6:00pm at 3827 94th Ave NE. Tour BDR Fine Homes newly completed luxury home while enjoying hors d’oeuvres provided by Bis on Main and gourmet treats by Lady Yum. Located in the heart of the exclusive Yarrow Point community, this fresh new luxury home boasts over 5,100 Sq. Ft. with 4 bedroom suites plus a den. The expansive signature outdoor room is designed for year-round entertaining, featuring heaters, a fireplace, TV, and BBQ. Ideally suited for families, this home features a large main-floor recreation room and an upstairs bonus room complete with a signature snack shop. The chef’s kitchen features professional grade appliances and an expansive 10′ kitchen island. Presented by Art Whittlesey & Kitty Ballard of Windermere Real Estate, this new luxury home is offered at $3.4M. 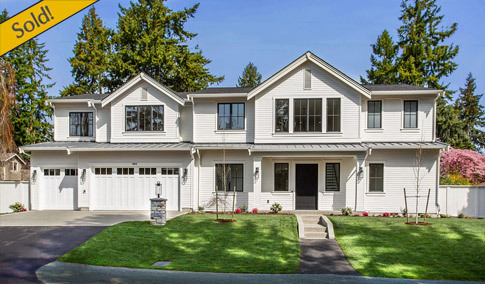 Situated in an ideal West Bellevue location, this fresh new Traditional design by BDR Fine Homes boasts 5,338 Sq. Ft., 4 bedroom suites plus a den, and a large outdoor room complete with heaters, fireplace, TV, and BBQ. This new design offers the convenience and practicality of a separate prep-kitchen, mud room, utility room, and wet bar. This home can be equipped with a GenSuite, featuring a separate full-kitchen, bath, living room, and bedroom, all accessible through a separate entrance. This luxury home is situated on a large private lot with sunny western exposure. The convenient location is a short walk from Medina Park, Medina Elementary, St. Thomas School, and Overlake Golf Course. This luxury home will be completed in May of 2016. 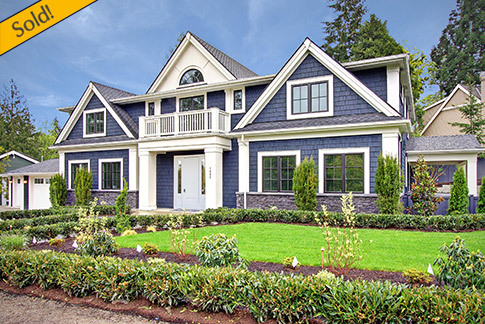 Located on the renowned North-end of Mercer Island, this fresh new Traditional design boasts over 5,000 Sq. Ft., 4 bedroom suites plus a den, and a large outdoor room complete with heaters, fireplace, and TV. The chef’s kitchen features state of the art appliances and an expansive 12′ kitchen island. The separate prep kitchen, large pantry, and mudroom make this fresh new design ideal for today’s modern living. This luxury home is situated in an ideal location within walking distance to numerous parks, the community center, and downtown Mercer Island. 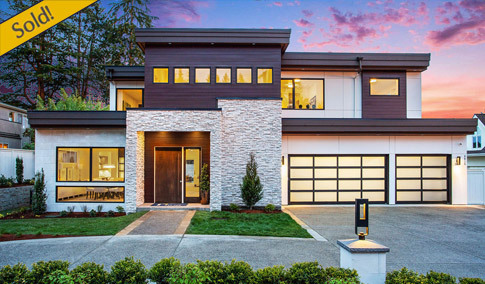 Situated in a premier West Bellevue location, this fresh new design by BDR Fine Homes boasts over 5,100 Sq. Ft. and 5 bedroom suites plus a den. The large outdoor room is designed for year-round entertaining, featuring heaters, a fireplace, and TV. Additional luxury features include an expansive 10 foot kitchen island, a separate prep kitchen, mud room, and a large den/office complete with fireplace. The signature Gensuite guest-suite features a kitchen, living/bedroom, and bathroom, all accessible through a private entrance. This home is conveniently located a short walk away from Medina Park, Medina Elementary, & St. Thomas school. This luxury home will be completed in January of 2016. Discover convenient and luxurious living in the heart of downtown Redmond. These fresh new townhomes are located just a few blocks from Redmond Town Center and offer a quick-connection to the Microsoft Redmond campus. The practical floor plans offer spacious 2 & 3 bedroom designs and feature gourmet kitchens with center islands that are accented by high-quality appliances. Enjoy the convenience and security of the private 2-car garages that are attached to each unit. With shopping, recreation, and major employer headquarters just minutes away, these new Redmond townhomes offer the very best in convenient modern living.